Saganaga Lake is one of the largest lakes in all of the Boundary Waters and offers the most overnight paddling permits of any entry point (#55) on the Gunflint Trail. With its massive size comes an almost endless number of campsites running the gamut from some of the worst we have ever seen to some of the nicest. 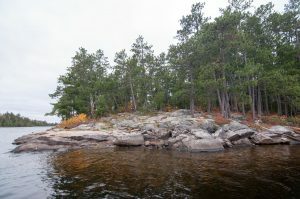 You will fall in love with its stunning beauty and excellent fishing opportunities, while at the same time learn to hate its treacherous winds. The majority of the lake allows motors up to 25hp and the Canadian side does not restrict motors at all. 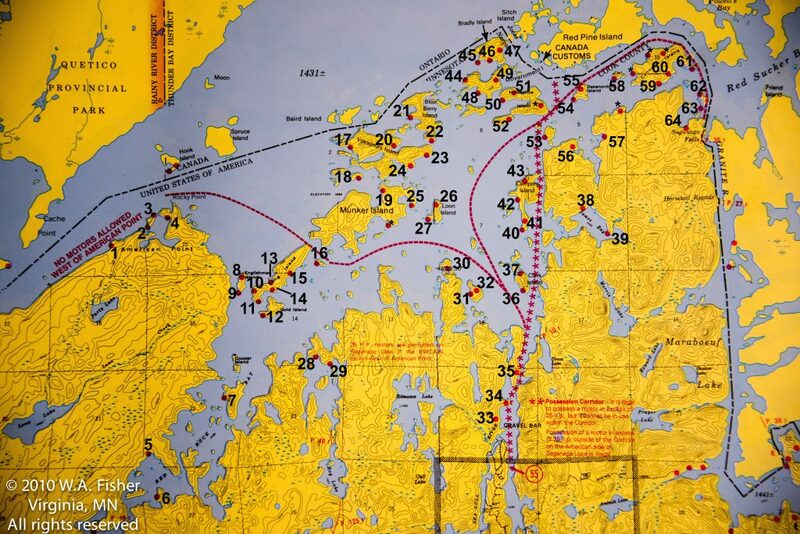 Entry point 55 allows access to Saganaga and from there you can enter Quetico Provincial Park, start a trip down the border waters into Ottertrack Lake, or make a quick loop down through Red Rock Lake and back out on Seagull Lake. 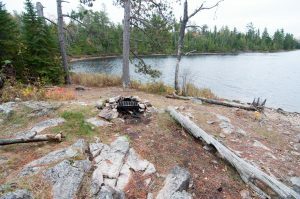 Regardless of your campsite needs you will find what your looking for on this monstrous beauty. 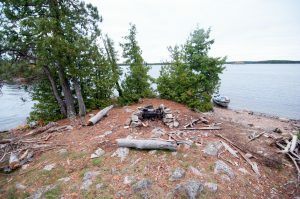 It makes sense that this site is the first on the list as it may be the nicest on the entire lake. 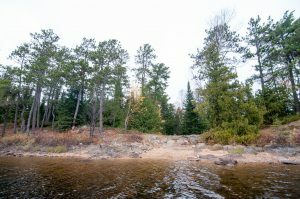 The huge (by BWCA standards) sand beach makes for a perfect canoe landing, beautiful spot to enjoy the sunset and in the summer excellent access to the water for swimming. 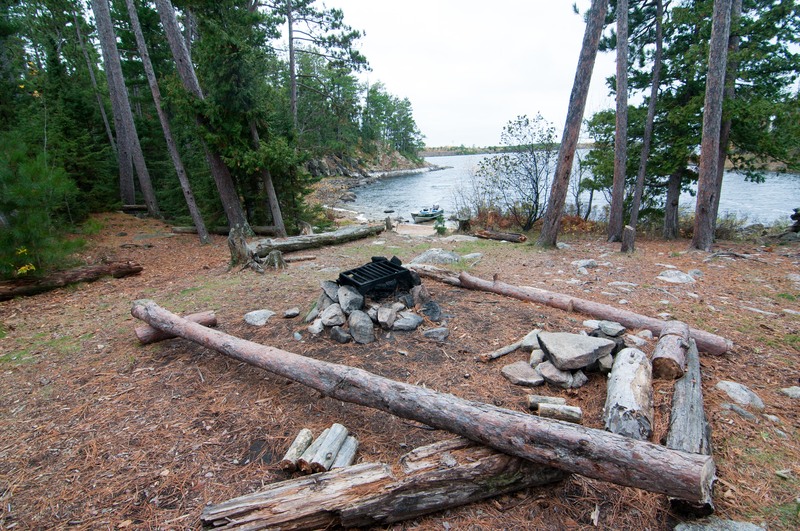 The site itself is adjacent to the beach and is quite roomy with plenty of tent pads. 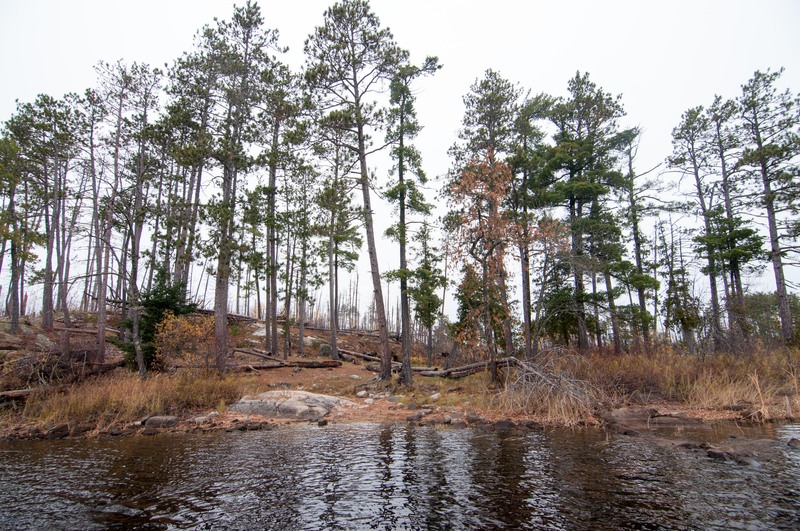 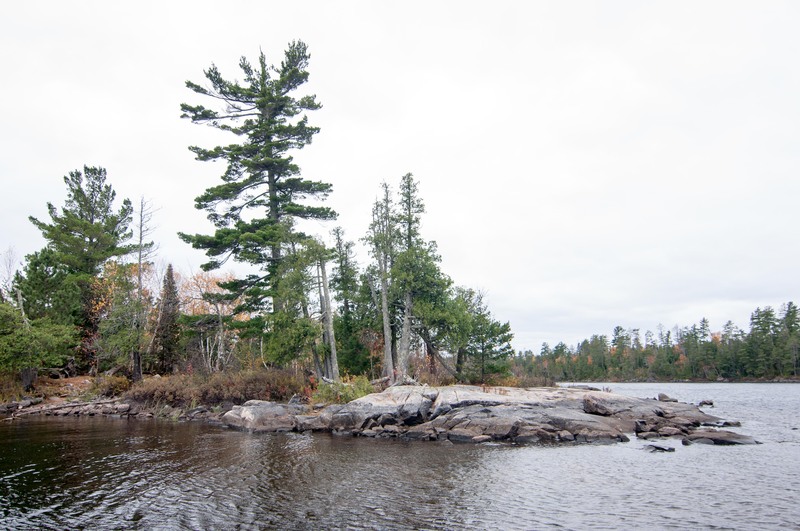 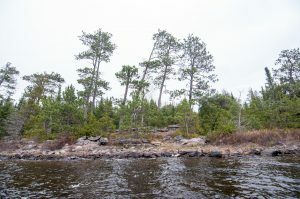 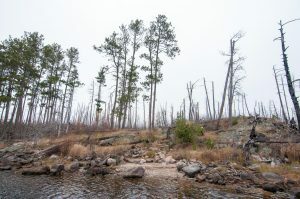 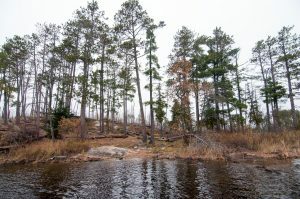 This one would be a contender if somebody were to put together “top 10” list of all BWCA campsites. 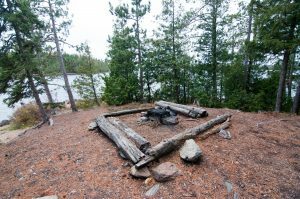 This elevated site faces west and offers a perfect balance of protect from the open water winds and views of big sky sunsets. 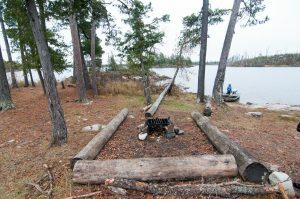 A nice gravel landing leads up to a large level site, with well “developed” log seating and solid tent pads. 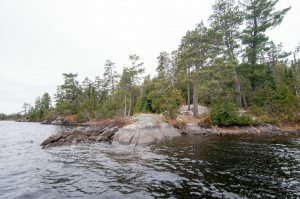 Uniquely nestled between the open water expanse to the north and calm waters of a bay to the south this relatively small site is quite nice. 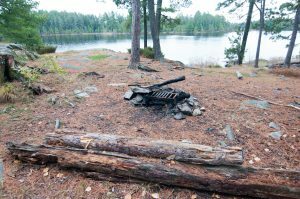 It is probably best suited for smaller groups as there is only one reliable tent pad. 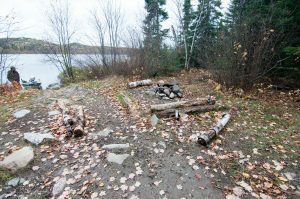 You’ll have to navigate through a narrow opening into the calm back bay to camp at this scrappy site. 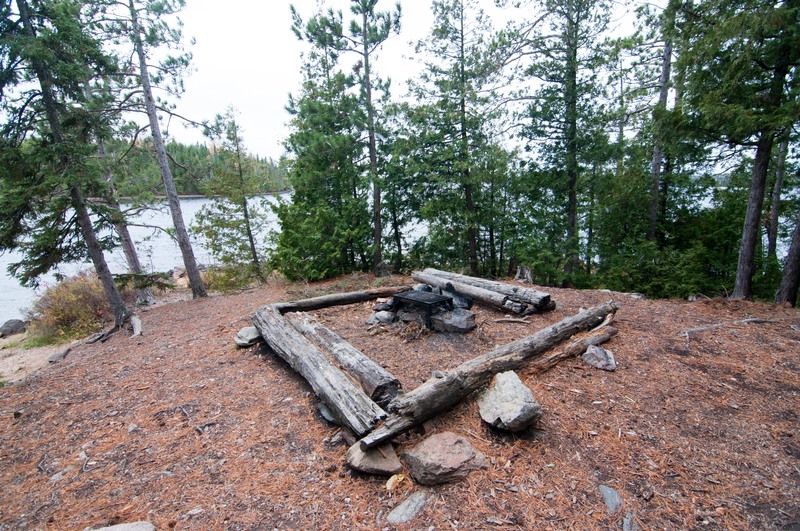 Its layout feels a bit forced and doesn’t have the feel of a more naturally occurring campsite. 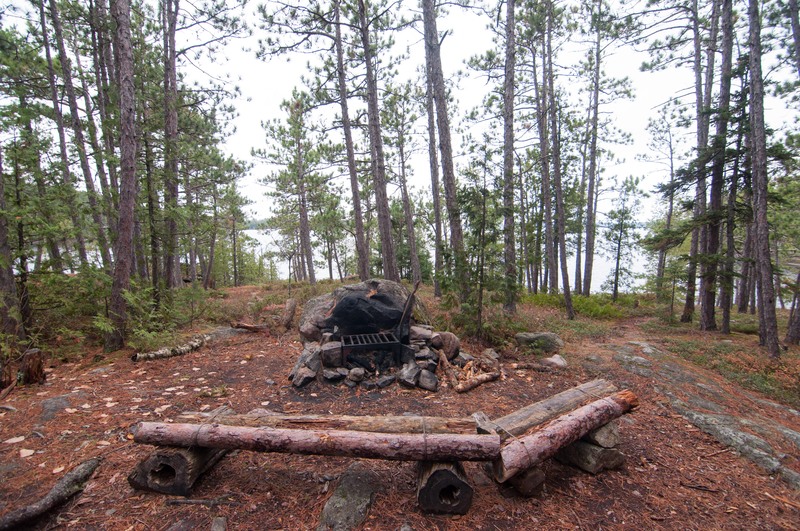 It could be a nice option on blustery days. 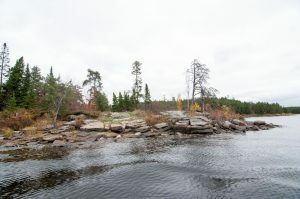 In the far southwest corner of Red Rock Bay is where you will find this average yet private site. 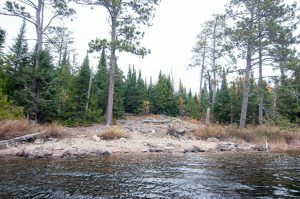 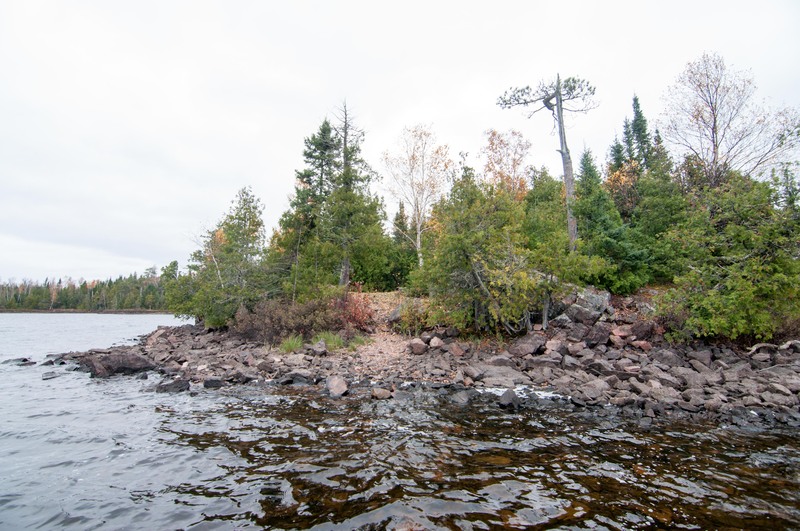 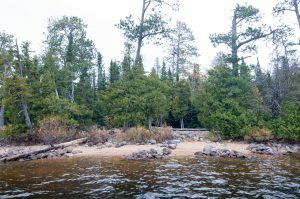 Though great fishing abounds throughout the entire lake, this area has some real hot spots, and a short portage into Red Rock Lake will provide you with even more opportunities at excellent fishing. 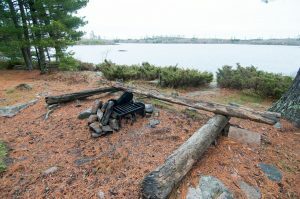 This large elevated site with multiple tent pads is quite exposed to the elements which won’t be a concern on those balmy summer days but I can’t image an enjoyable time on the days when the weather is up. 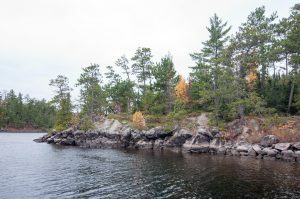 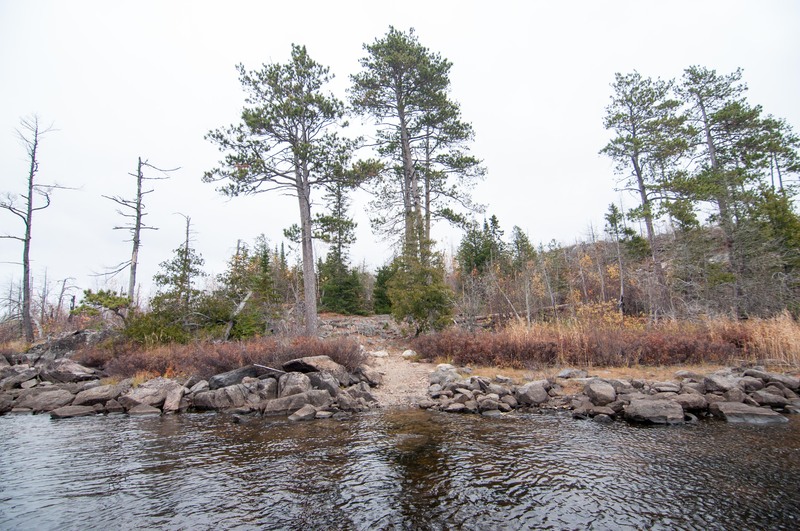 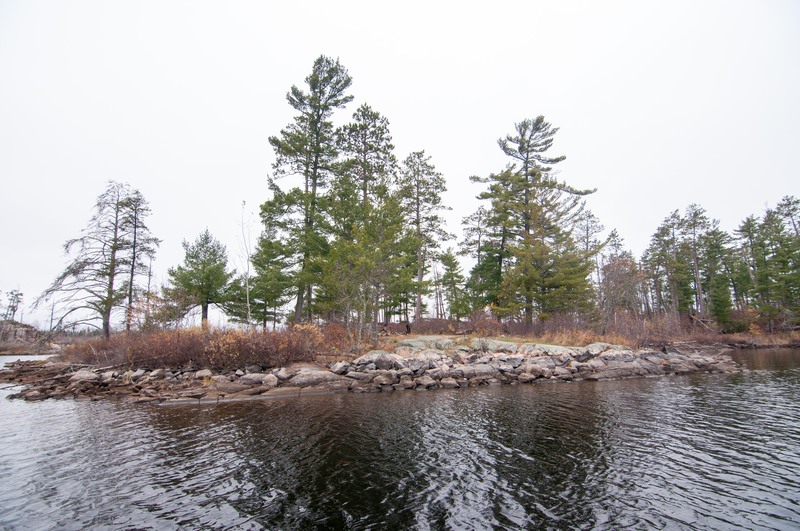 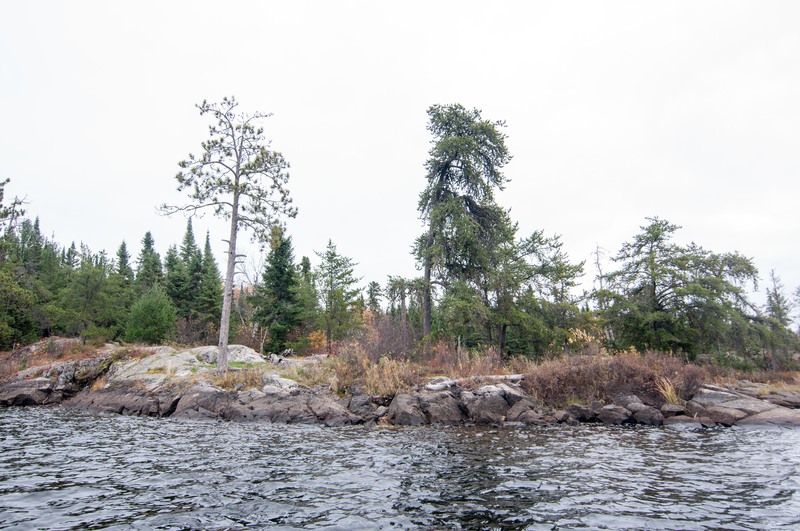 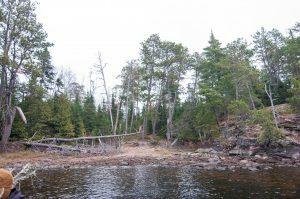 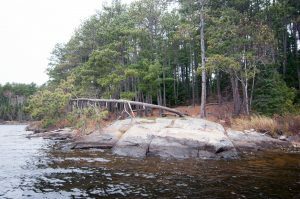 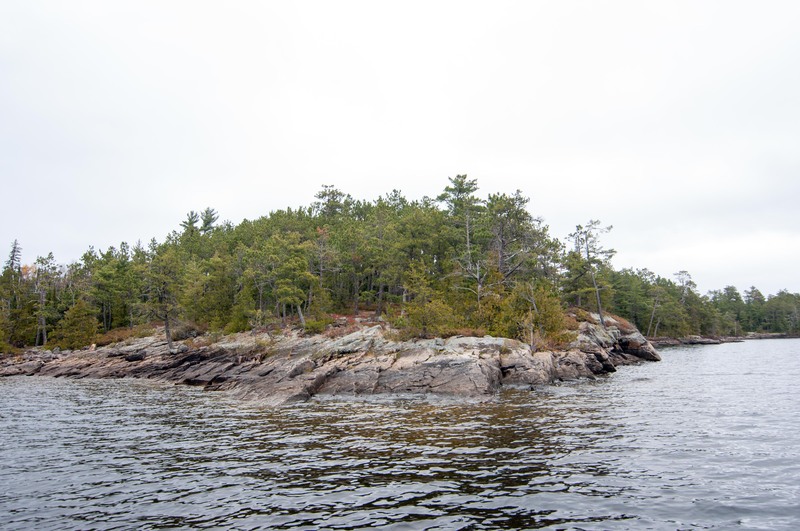 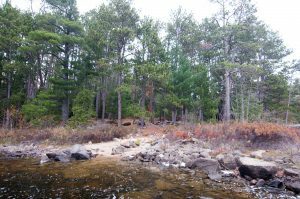 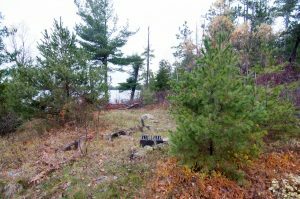 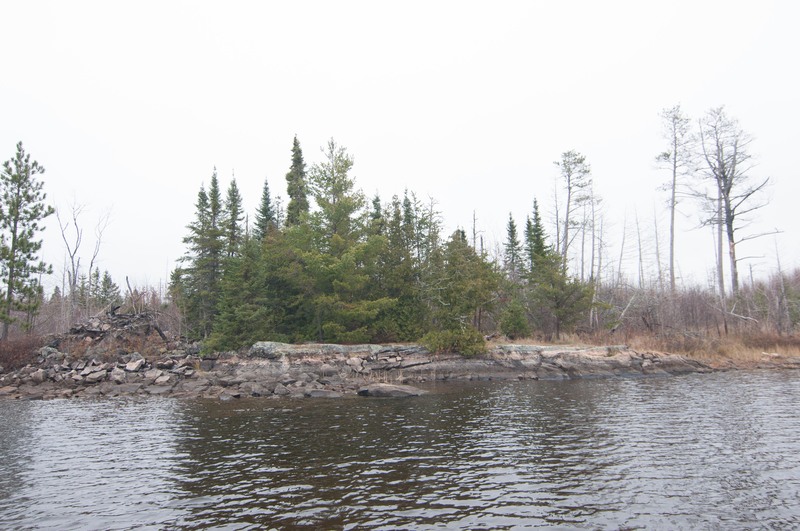 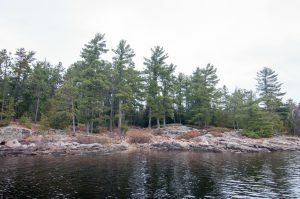 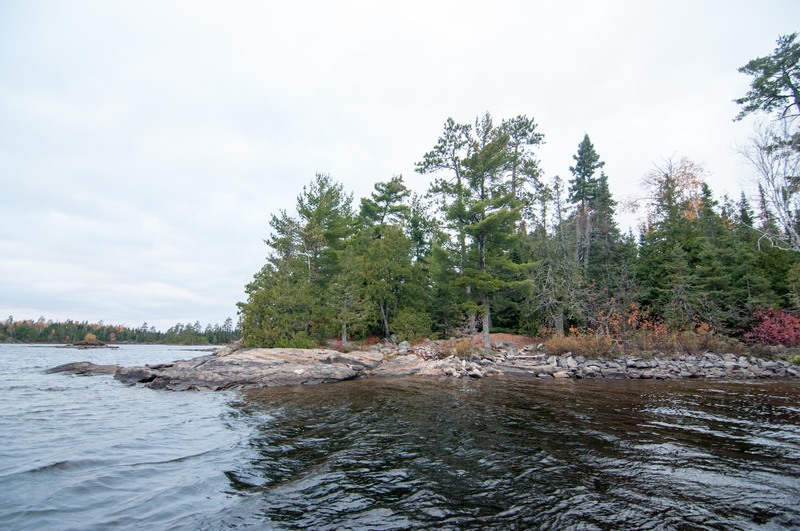 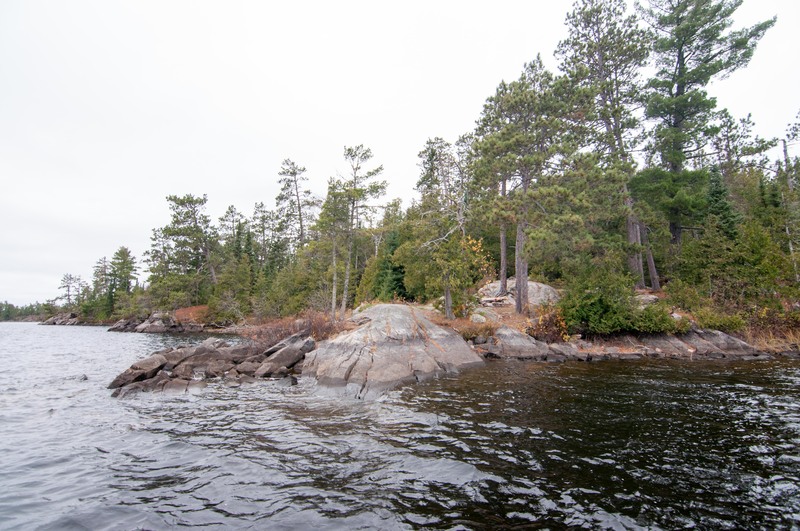 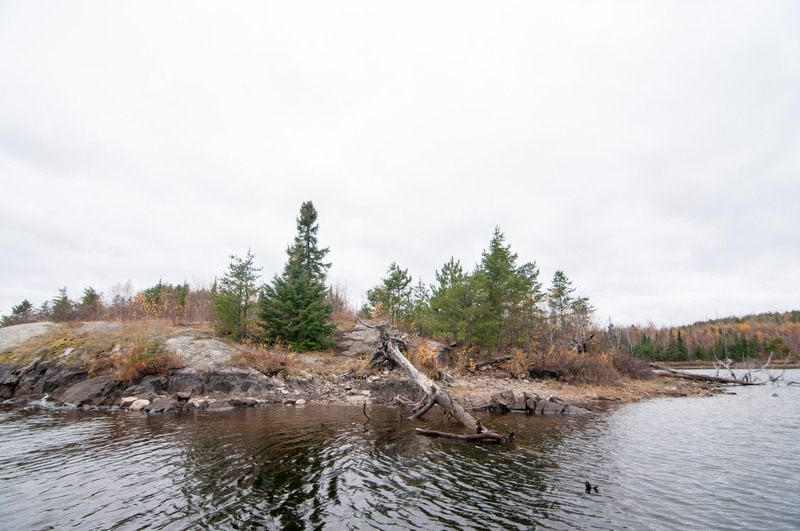 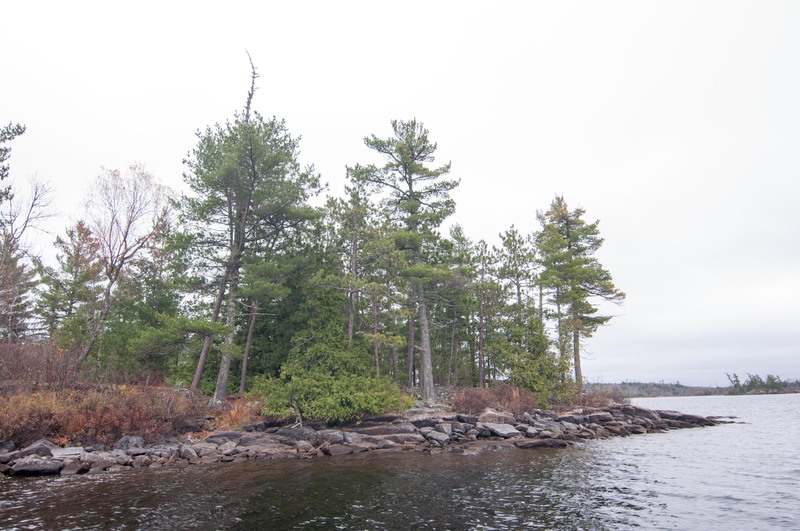 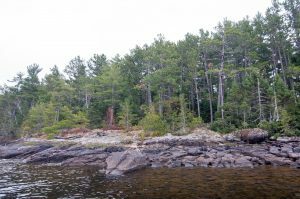 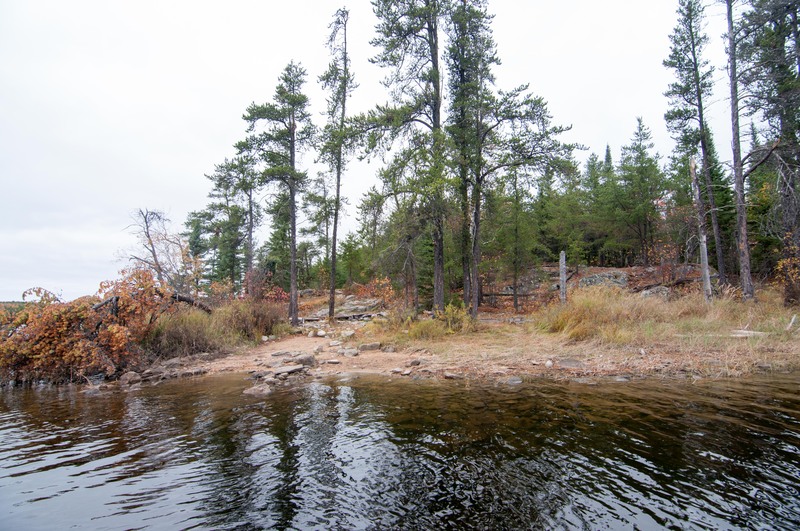 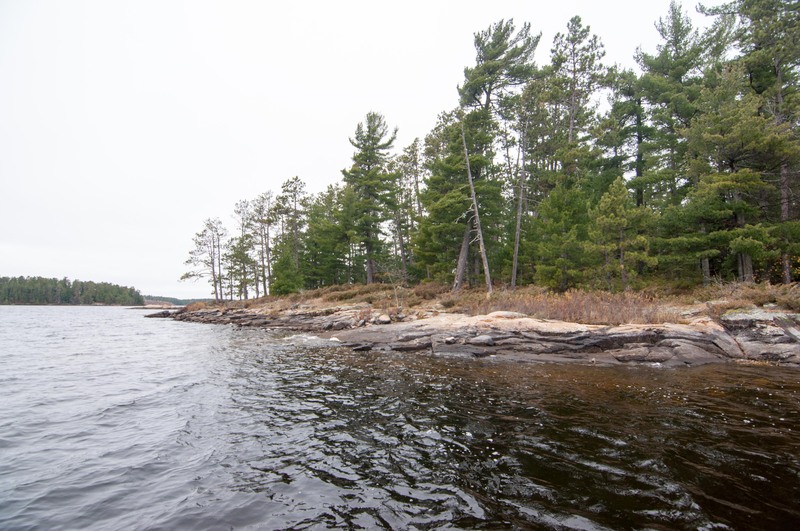 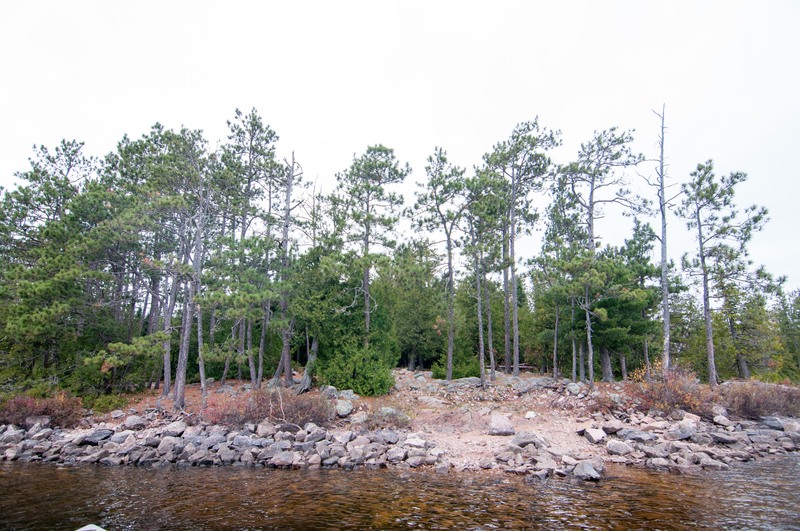 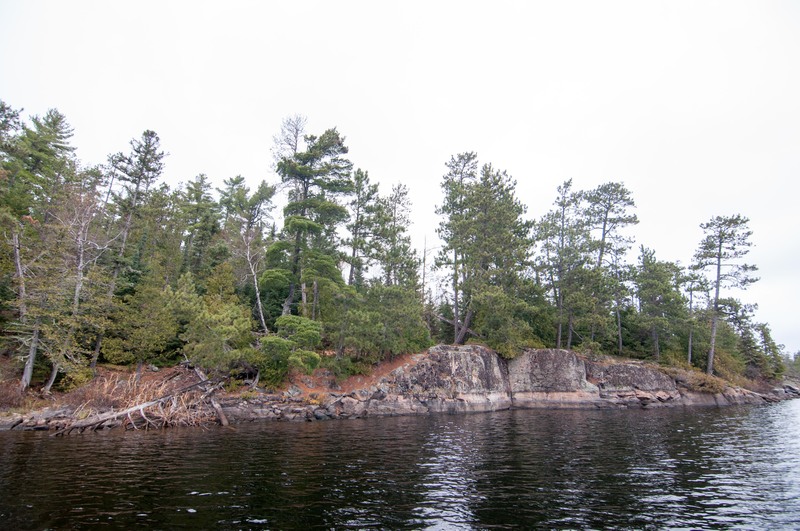 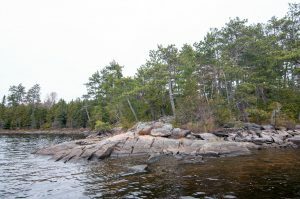 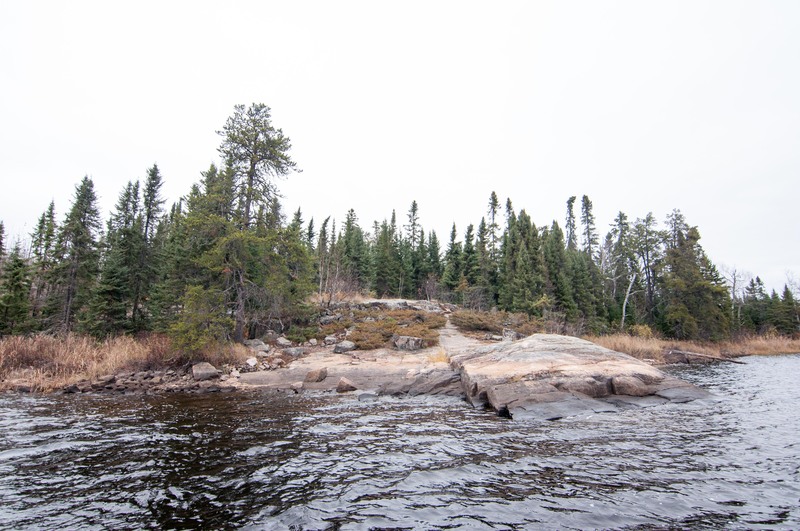 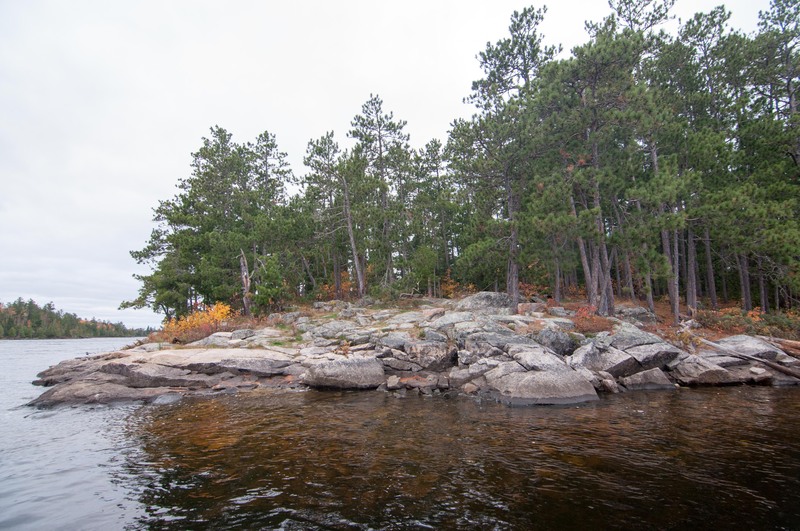 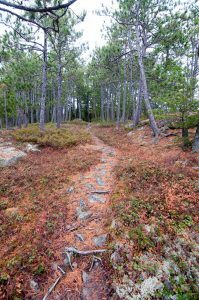 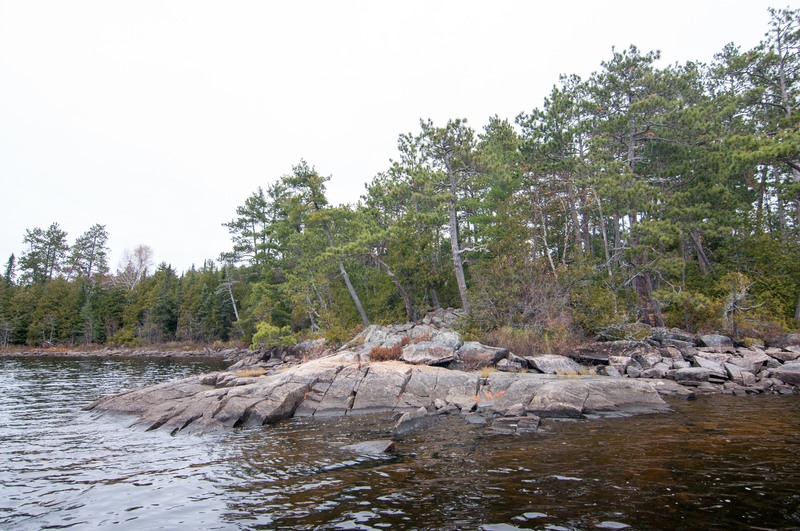 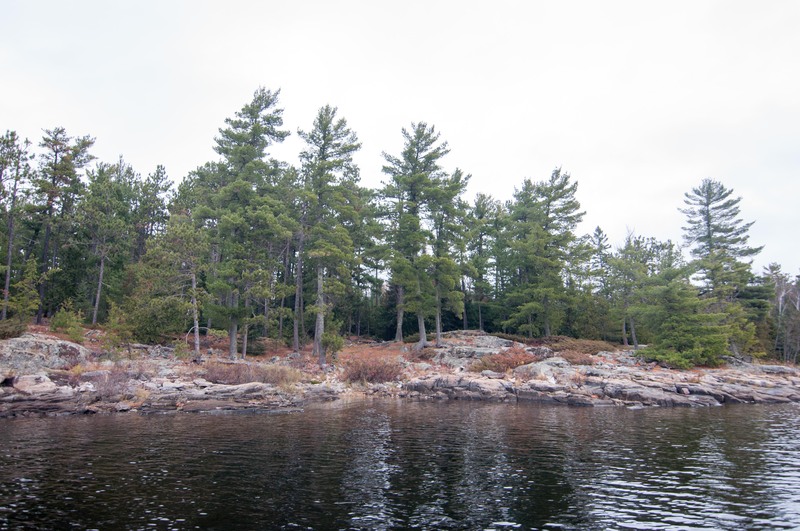 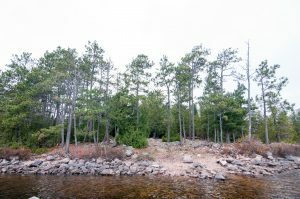 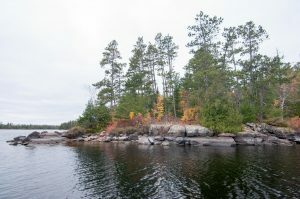 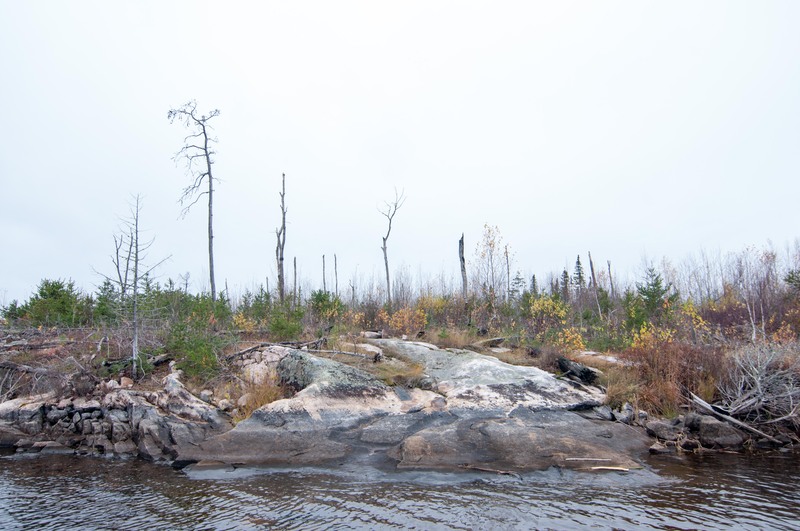 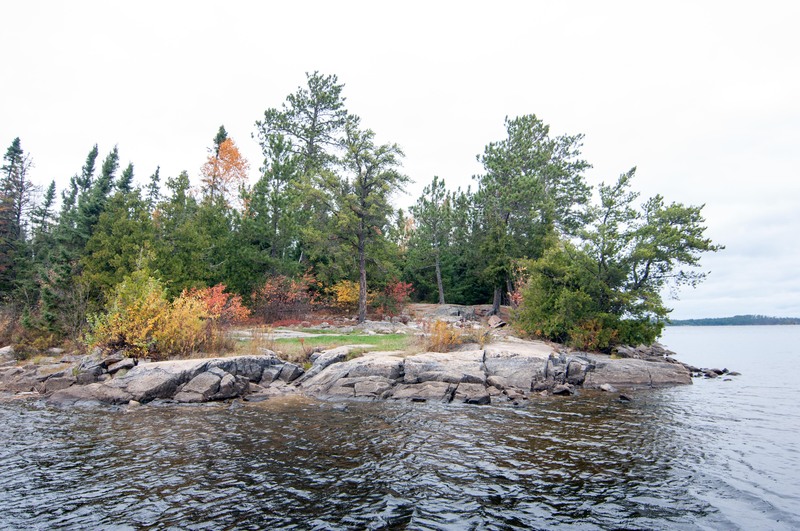 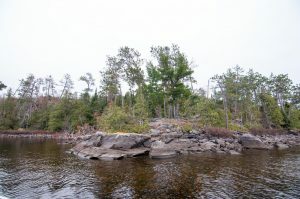 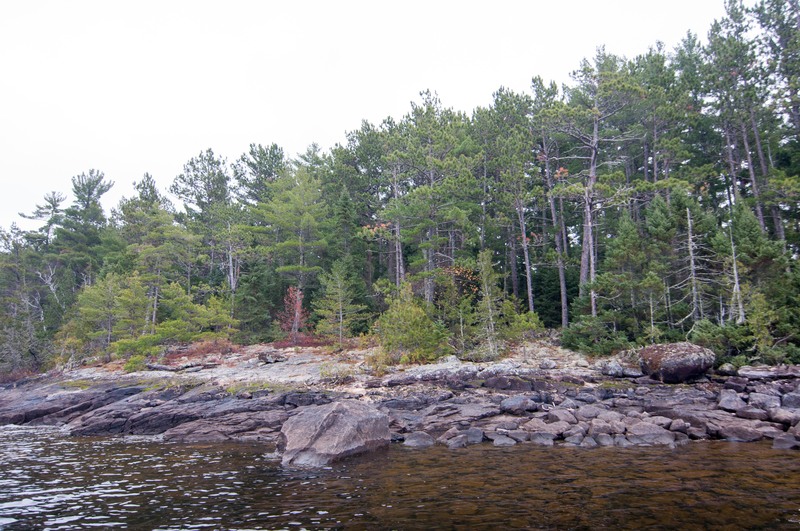 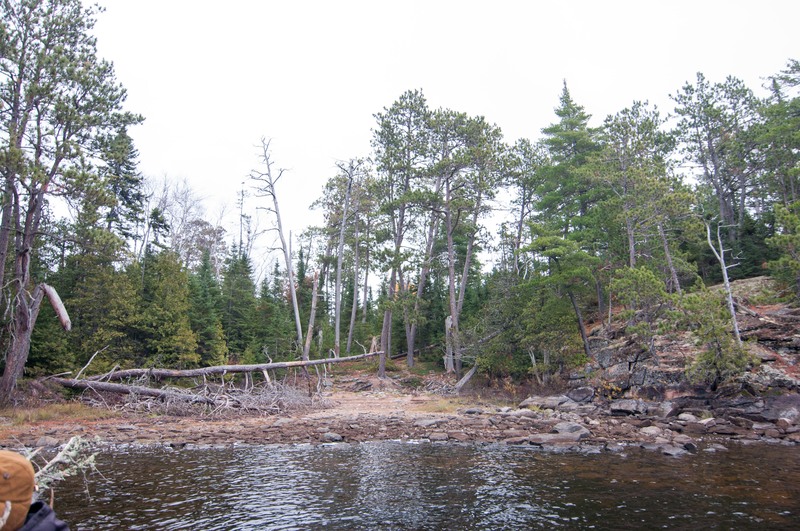 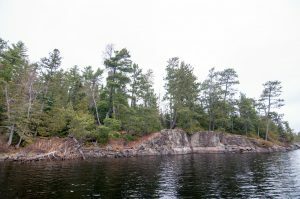 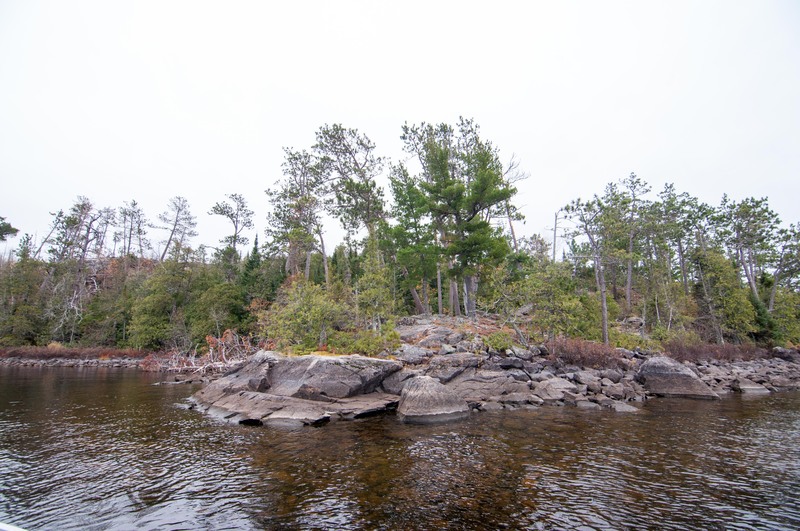 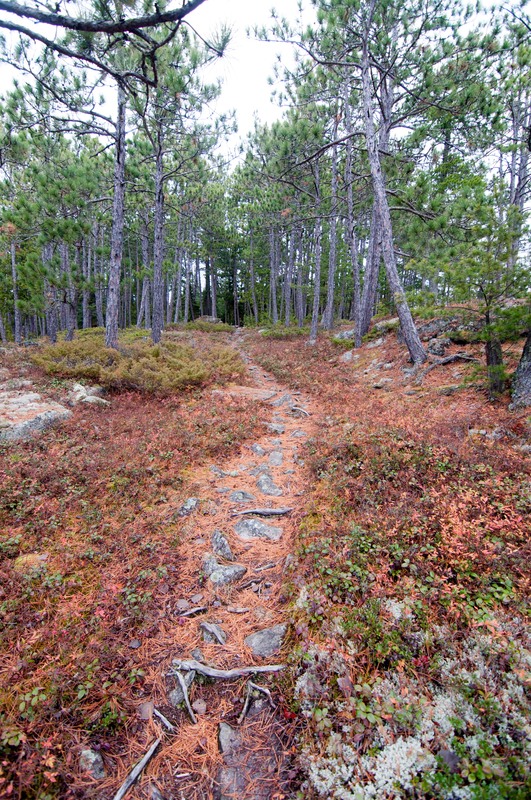 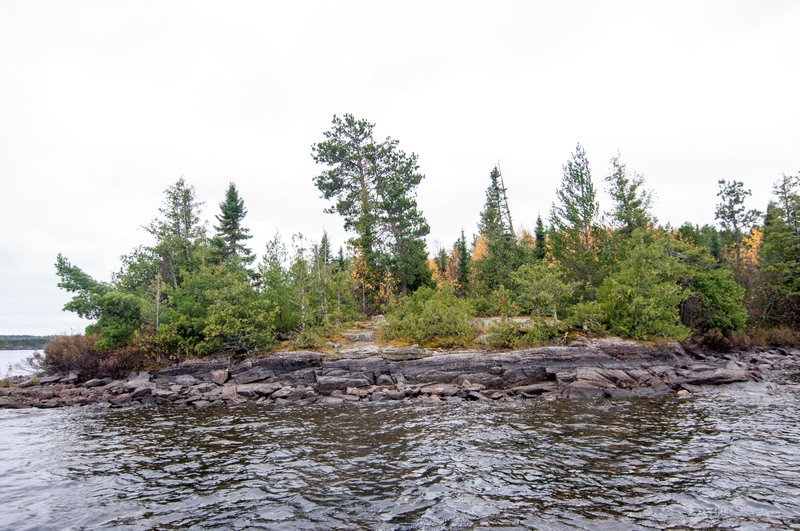 The last of the three sites in Red Rock Bay sits atop a slab of sloping Canadian shield. Though elevated and facing the west there is plenty of shelter towards the back of the site should you need it. The views from the fire grate make this one of the nicest spots on the lake. Its location on the north side of Englishman offers some of the most expansive views of any site on the lake. 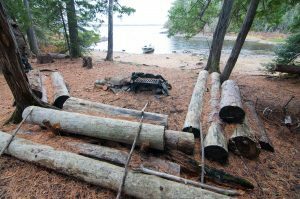 From experience I know this can be a beautiful thing and a terrible thing if a cold spring wind is blowing from north for two days straight. 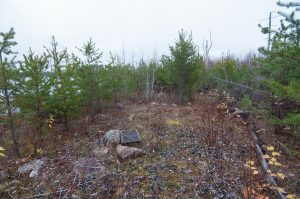 There is a trail that connects this site with #9 if you were interested. Yet another contender for the hypothetical “top 10” BWCA campsite list this stunning campsite is what I think of when I imagine a perfect summer destination. 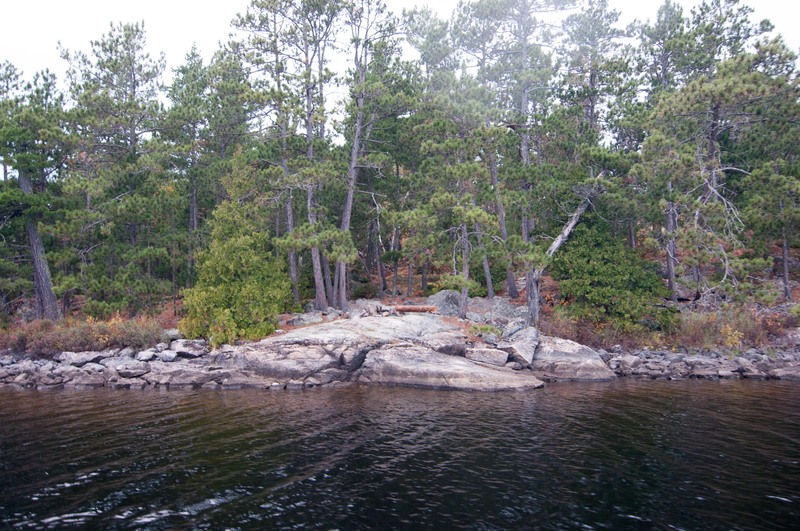 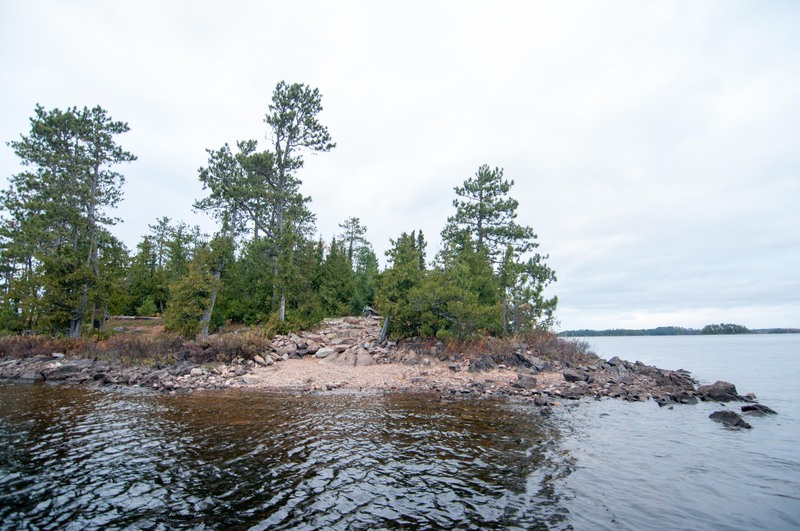 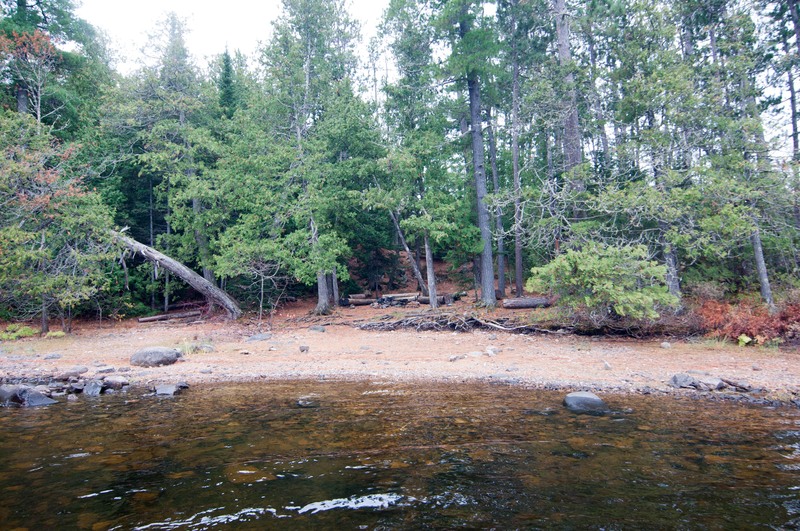 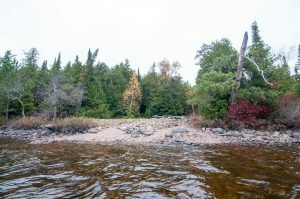 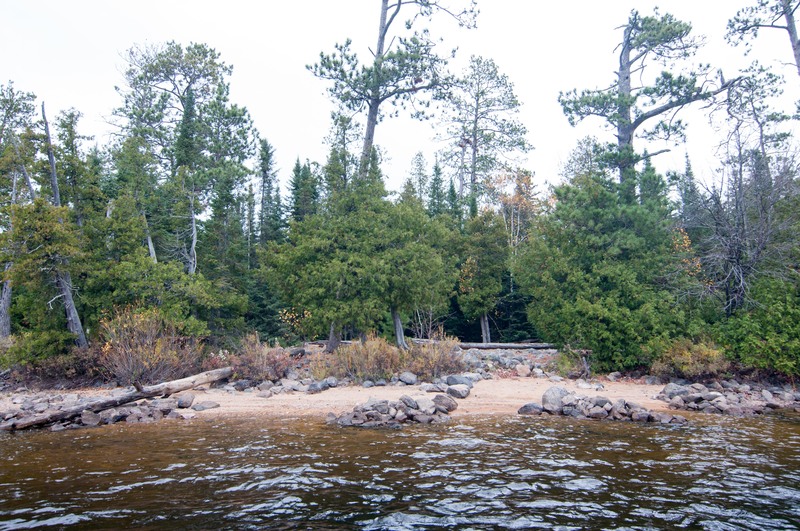 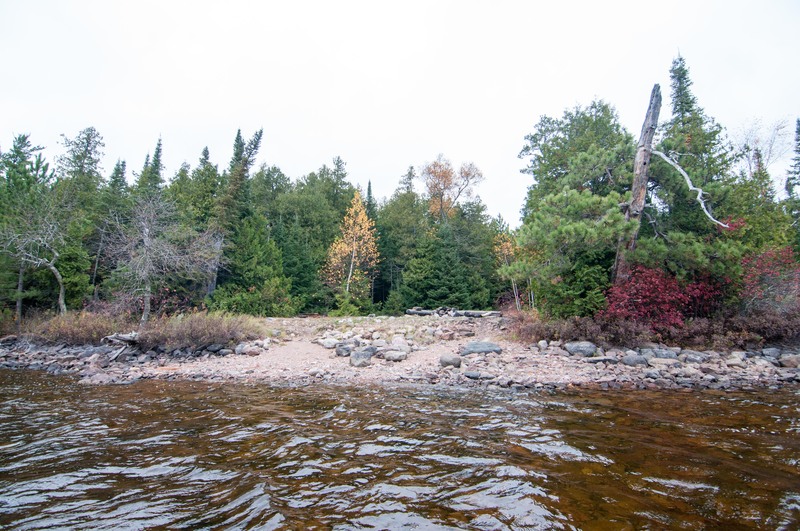 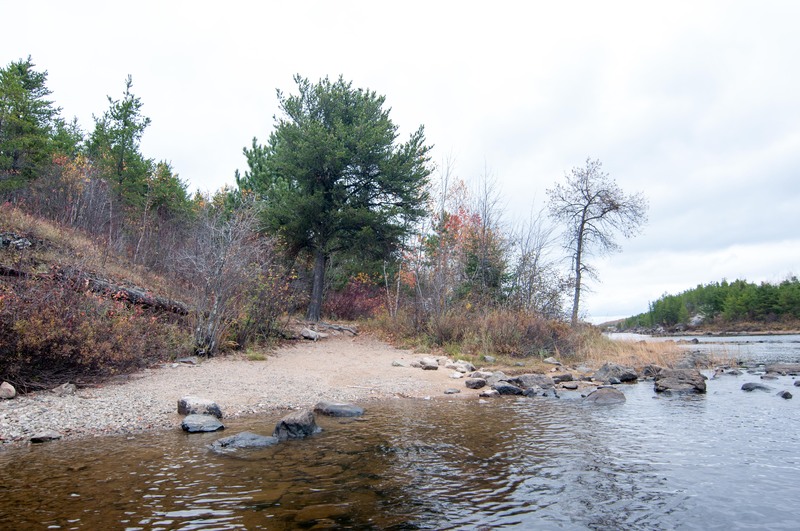 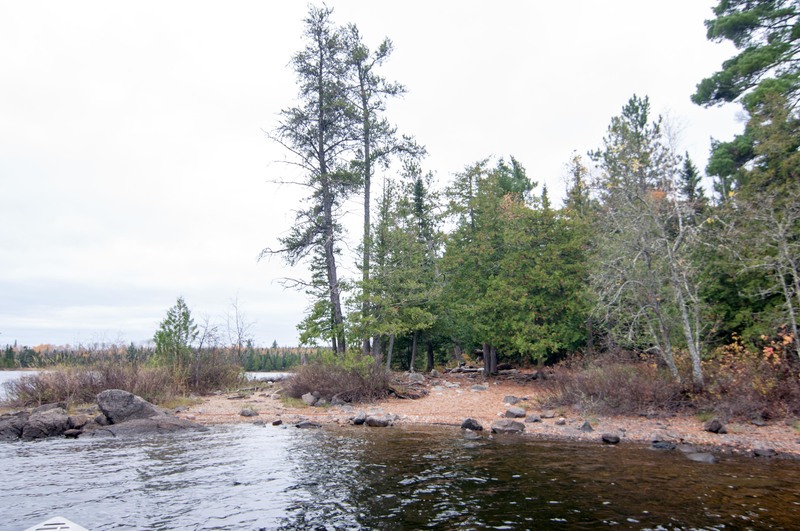 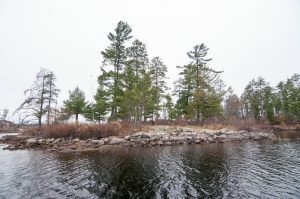 A large gravel beach surrounds this spot making for great swimming and canoe landing. 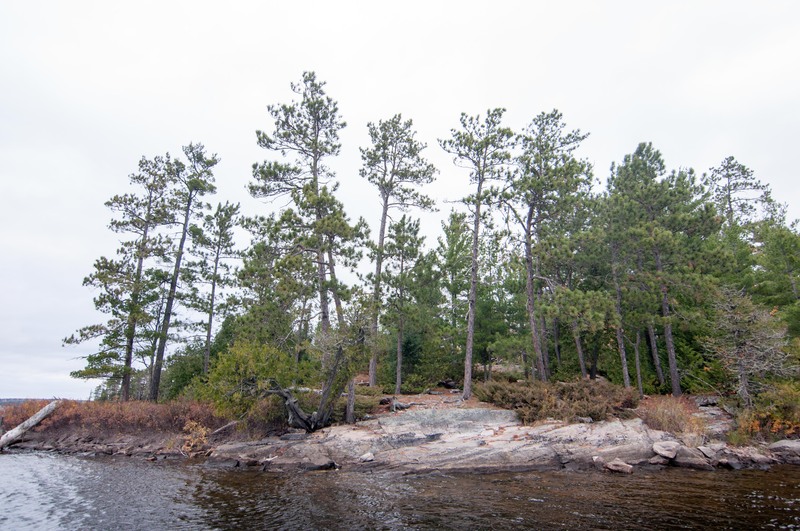 Beautiful old growth red pines tower over head to provide enough shade on summer days, but probably not enough protection from the wind on nastier spring and fall days. 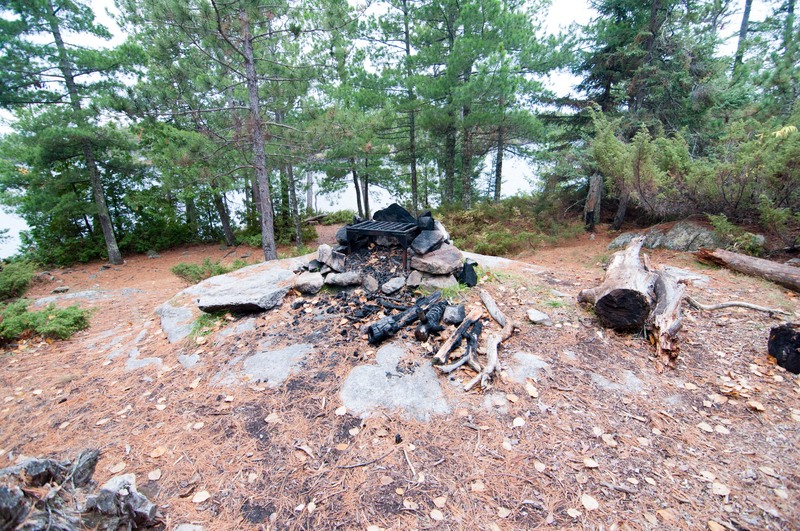 Unfortunately, none of the characteristics of campsite #9 rubbed off on this one. 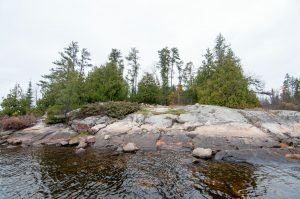 It has a decent gravel landing, but the site itself is riddled with the tops of boulders which makes for uncomfortable walking and finding a decent tent pad rather difficult. 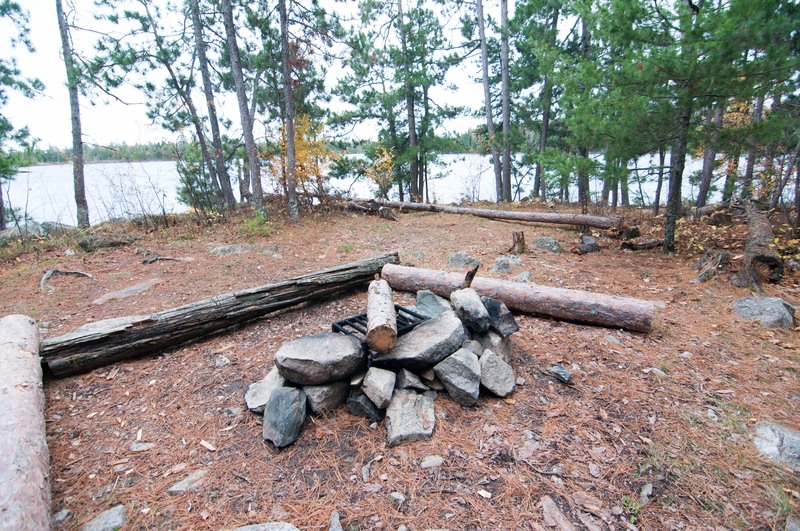 This is a nice little site, with a couple of small yet flat tent pads back in the woods behind the main entrance. 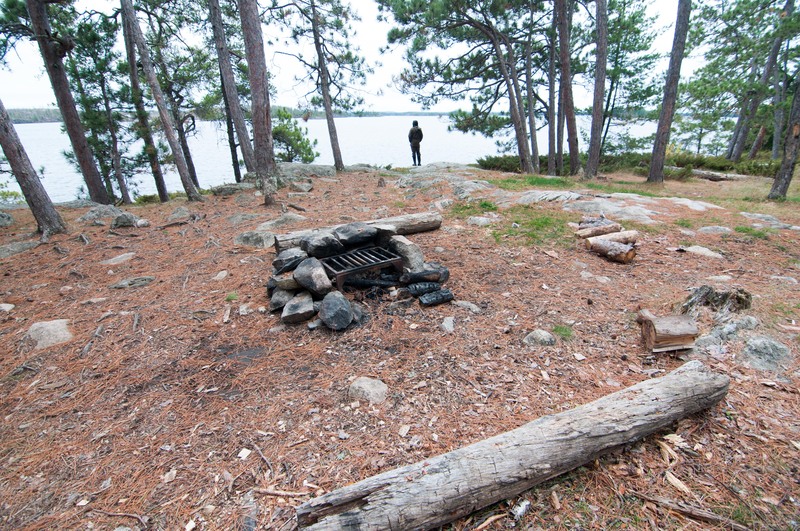 The fire grate area sits right at the waters edge, but does face campsite #12. 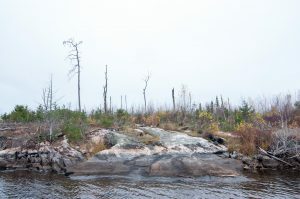 The terrain is a bit rocky as well. 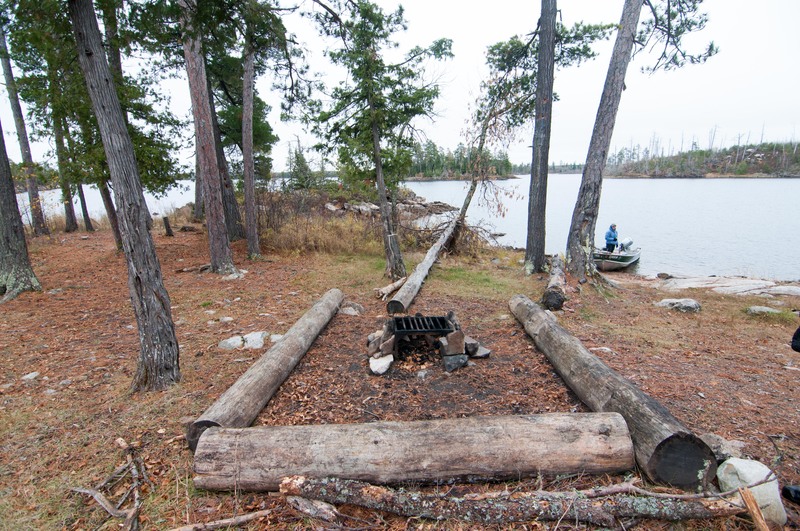 There are two landings to get into this campsite and the one farther to the east is much easier to navigate. 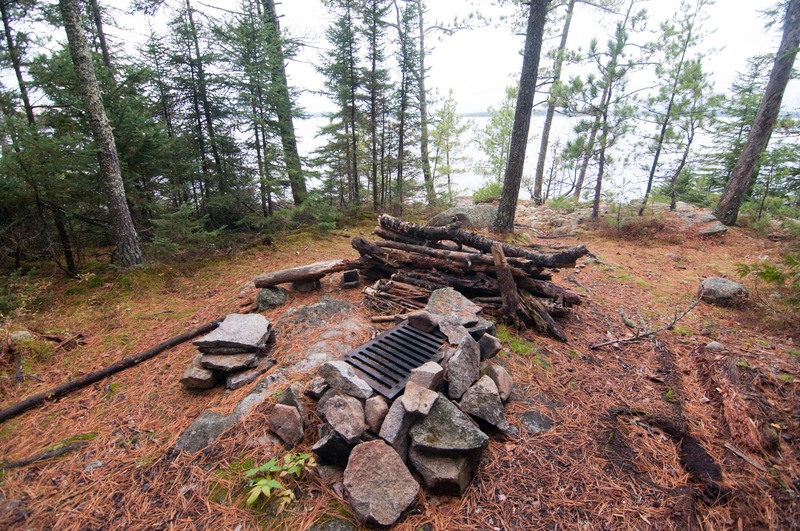 A nice private fire grate are makes up for the fact that it faces campsite #11. 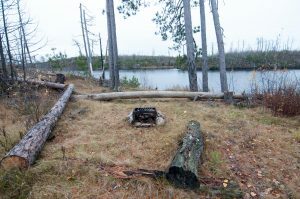 This would be a great spot to hole up on a nasty day. 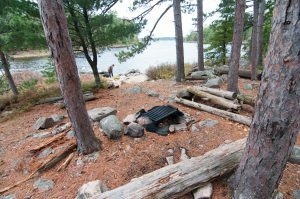 This awesome campsite has its own private lagoon and will have you randomly shouting “This is our land!” throughout your stay. 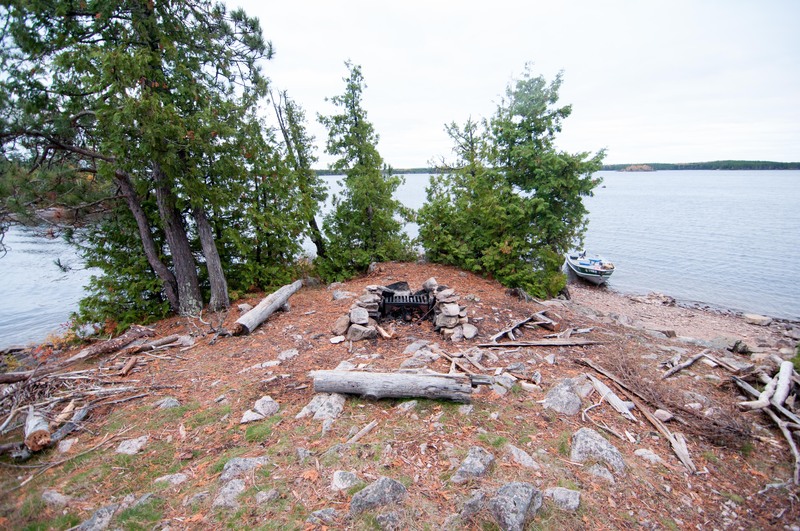 All Moonrise Kingdom references aside this spot is perfectly protected from the elements while still offering views out into the big lake. 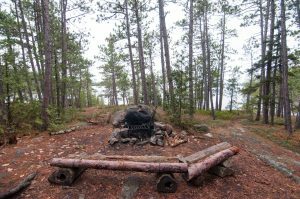 A wonderfully crafted seating arrangement around the fire and plentiful tent pads and hammock trees make this a classic campsite. 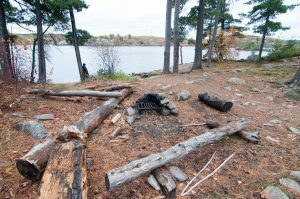 A well protected large campsite with plenty of flat ground is what you will find on the south side of Long Island. This would be a great choice for a large group. 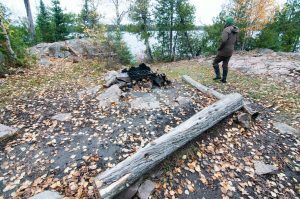 This spot is a bit rocky and uneven but would do the trick for most groups. Nicely spaced trees near the water front make for great hammock set ups. A beautifully flat slab of granite greets you upon pulling up to this site, unfortunately the island has been touched by fire over the years and feels a bit shrubby. 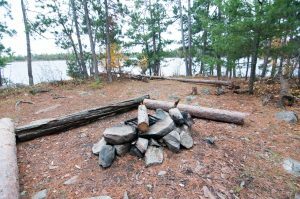 This is a pretty basic site, a small gravel landing, 2 small tent pads and a nice level fire grate make this a fine option. After navigating a tricky landing, you will find a nice large flat site with at least 3 tent pads and nice fire grate area. Being on the east side of the island helps keep the wind out too. 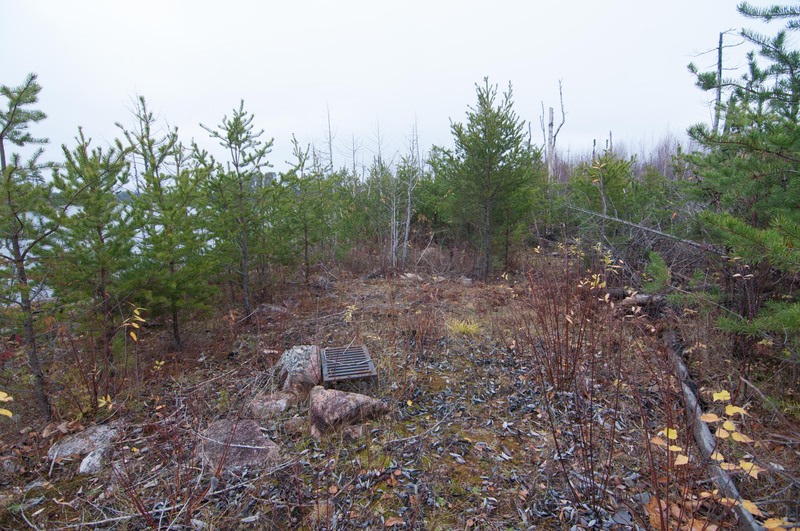 This site looks a lot worse than it actual is, but its still a weak site. 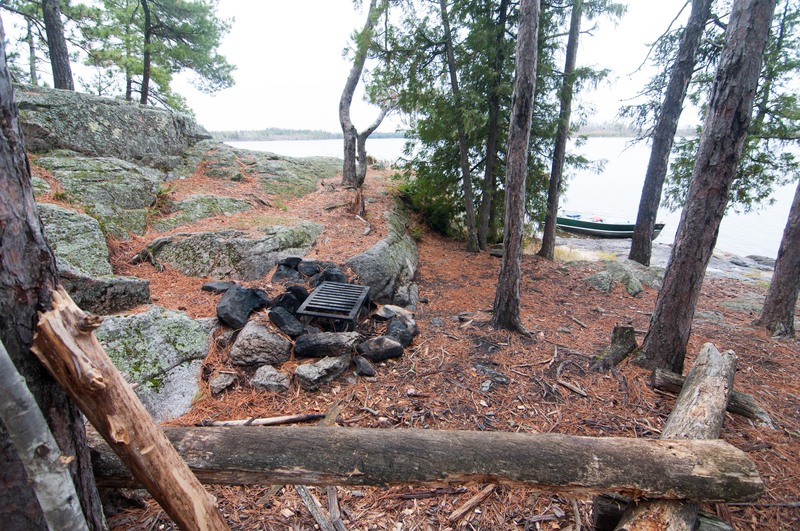 It has one solid tent pad and decent fire grate area, its landing it quite rocky and is very exposed to the elements. 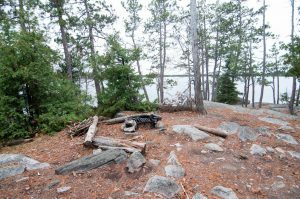 The elevated views of big open water from the nice benches next to the fire grate makes this a cut above other campsites in this area. The only take-away would be the two smaller than average tent pads. This is a well protected site, though it is small, has a tough landing and weird fire grate area, I suppose it would do fine for groups of 2-4. 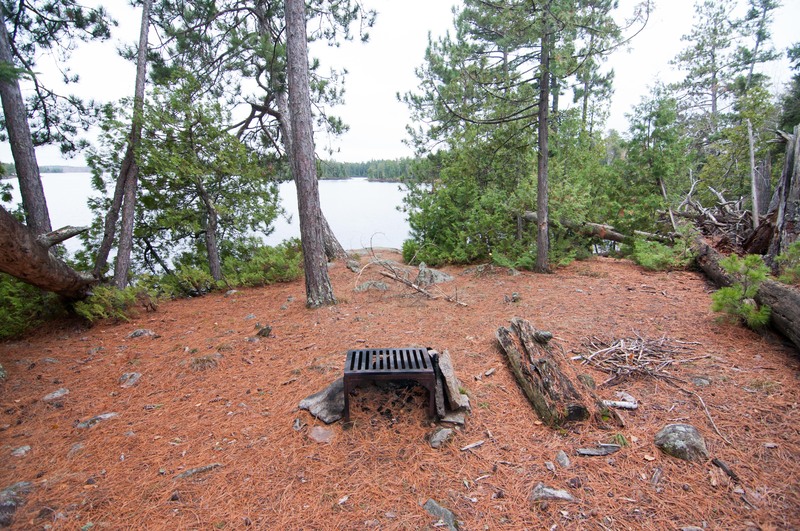 The nice view from the fire grate is really the only thing to mention about this otherwise lack luster spot. 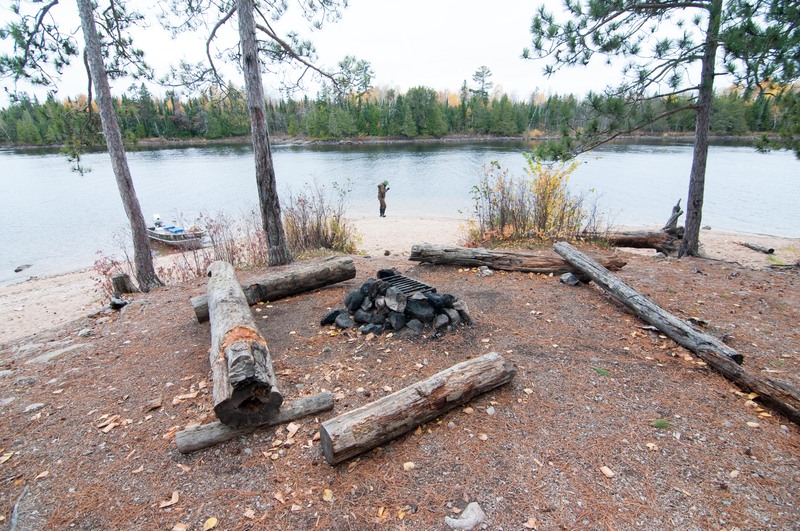 Another smaller campsite, but this one has a much larger tent pad that could fit two tents side by side. 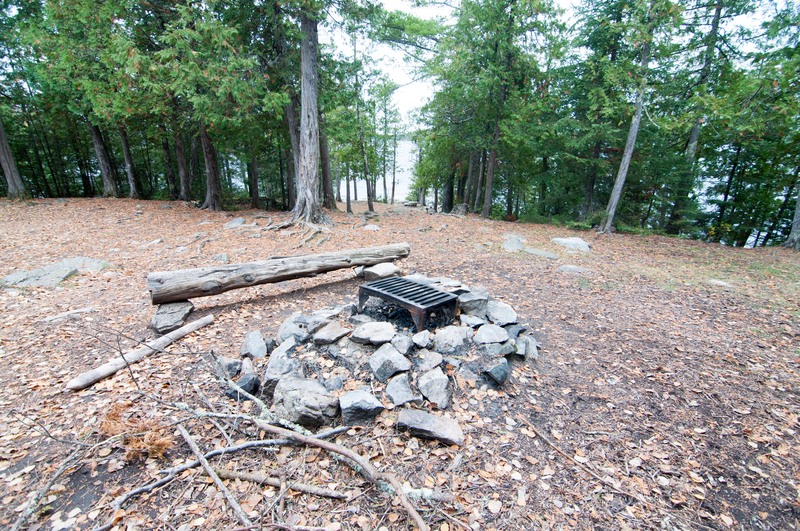 It has a decent landing and very nice flat sitting area around the fire grate. 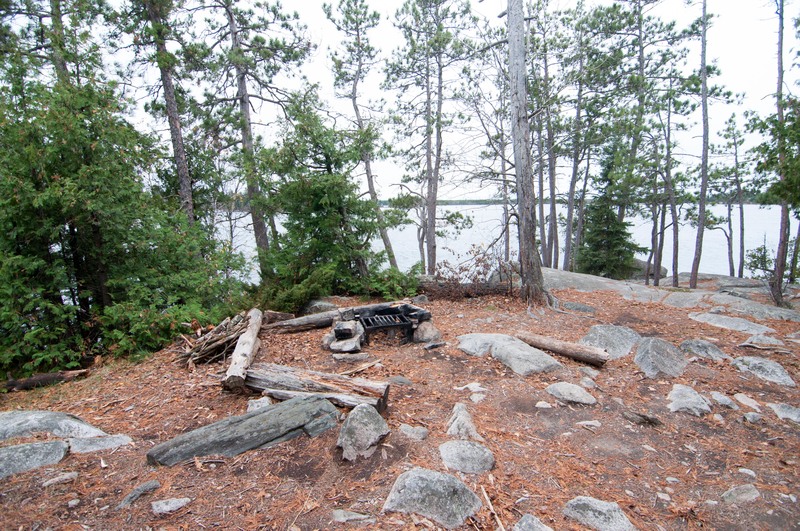 The large sloping rock landing leads directly up to the beautifully perched fire grate area. 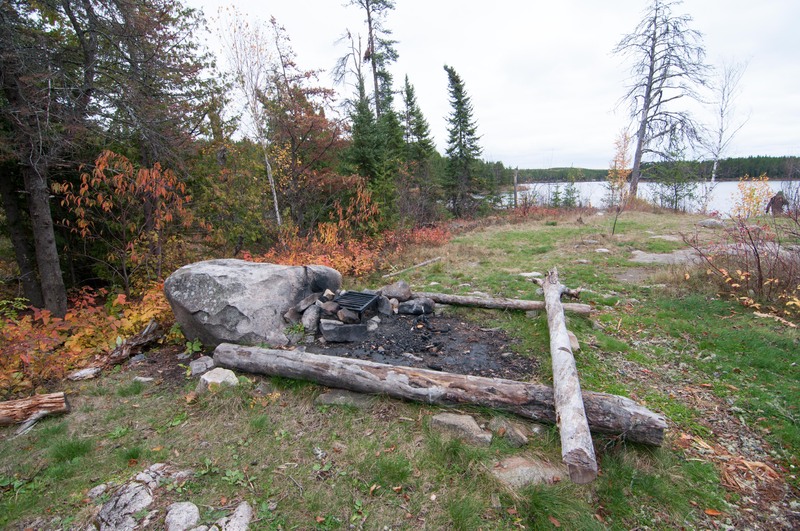 There are two nice tent pads directly behind the rock slab. Not the most private of sites, but a keeper in my books. This site has a nice landing and two very nice and large tent pads with a rough and tumble fire grate area in between. 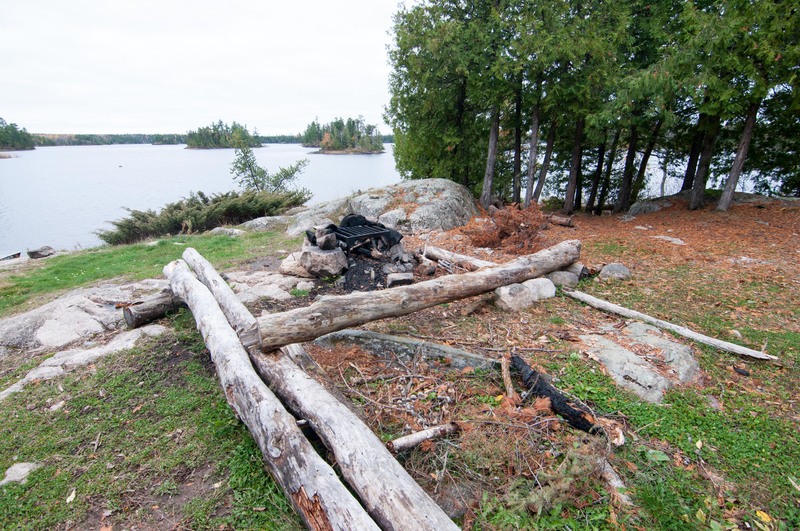 It seems a bit rocky around the fire and that each group is trying something different in terms of “camp furniture”. 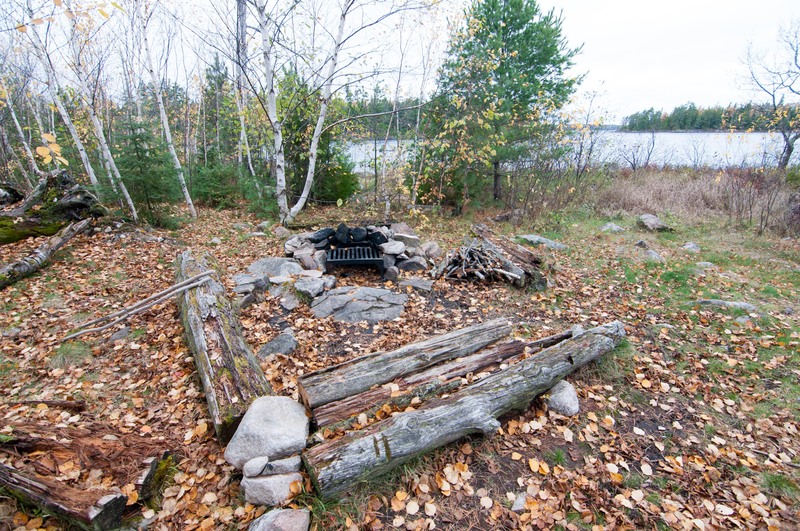 A small but serviceable site perfectly suited for a couple looking for a rustic site. On the south side of Loon Lake this campsite has a nice natural canoe landing area, flat maneuverable fire grate area, and two solid tent pads. 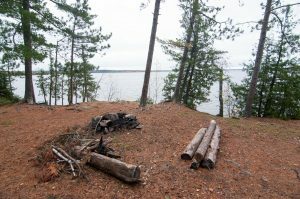 I would call this spot home any night. 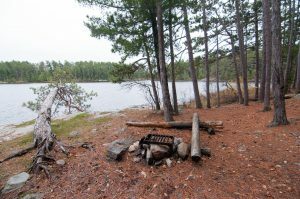 You will find this campsite in a secluded back bay on the south side of the lake and this is the preferable one out of the two in the bay. 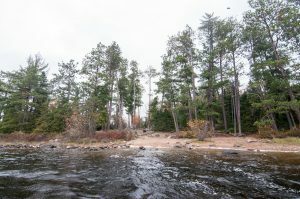 The dicey landing does not lead you to believe there is much more to hope for, but the main camp area was a pleasant surprise. 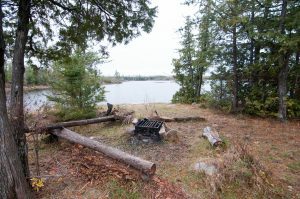 Nice grassy tent pads and a cool fire grate area nestled right up next to a boulder would make the out of the way trip to this quiet bay totally worth it. 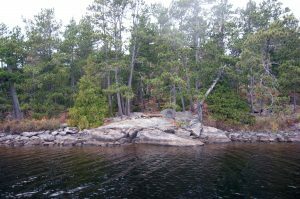 Just around the corner from #28 in the secluded bay is a funky spot. 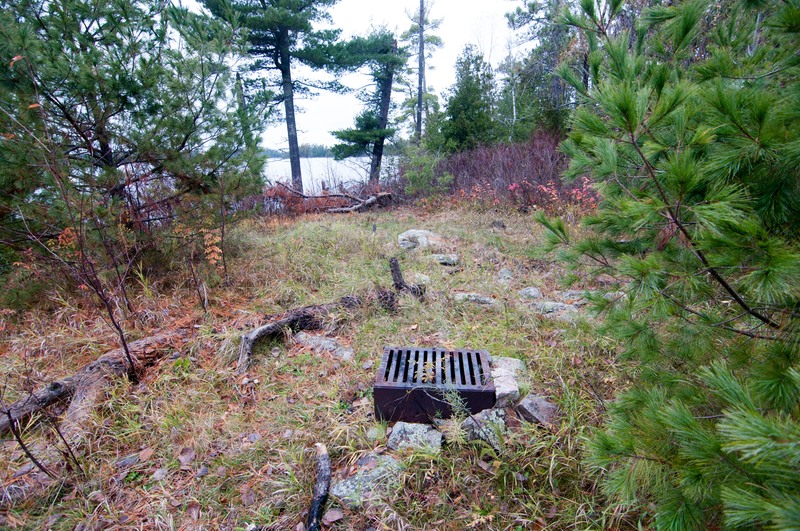 It has a nice landing and fine enough fire grate area, there was just something off about it. It is probably because it didn’t seem like it got very much use. What a great campsite! 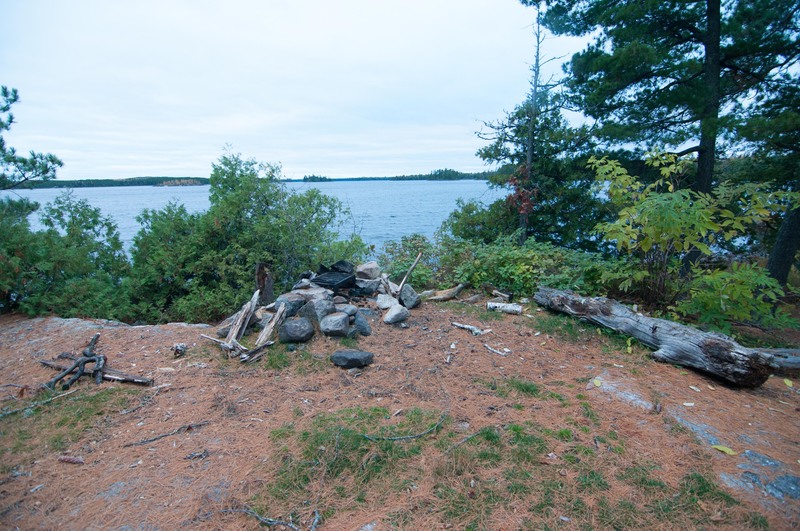 For whatever reason its location seemed like it was not going to offer much but it has a lot going for it. 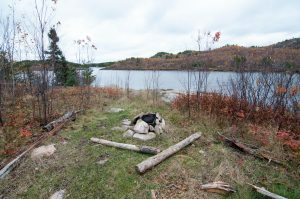 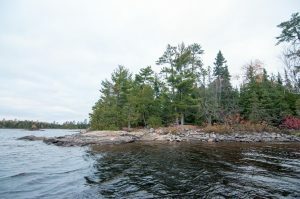 Besides the so-so canoe landing it has 3 really nice tent pads, most of which are grassy and a nice wide open fire grate area with perfectly positioned rocks. Though there are a couple nice tent pads and reasonable fire grate area at this site the canoe landing is an absolute failure. 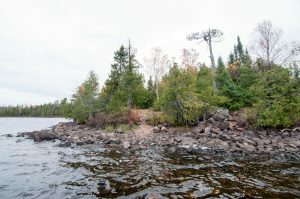 There are multiple rocks just below the surface yards before you even get to shore, I can’t imagine navigating this campsite in any sort of wind. The proximity to the border of the wilderness from this site makes me wonder who would ever camp here; you can literally see cabins from the beach at this site. 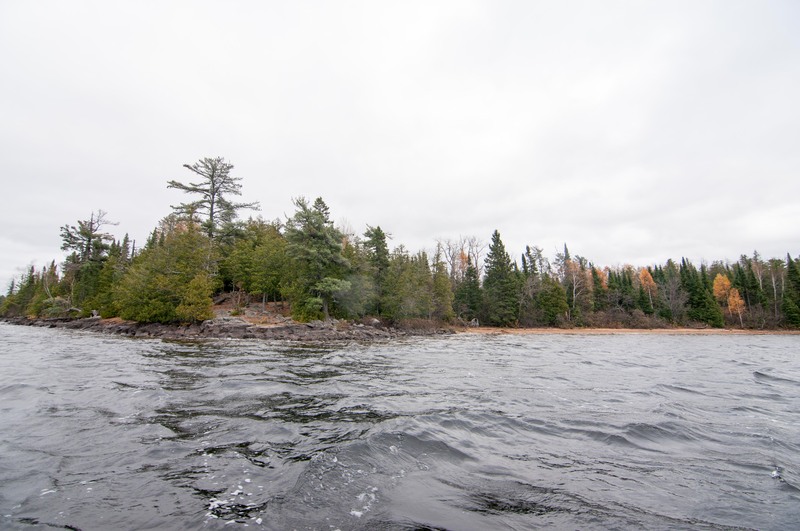 It clearly does not get used much and is in the main corridor which gets used by motorboats frequently. 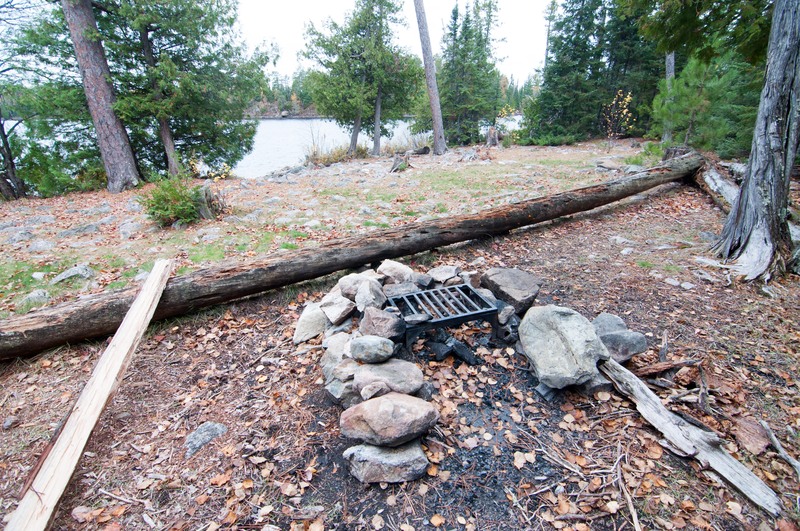 This seems like an emergency option to me. 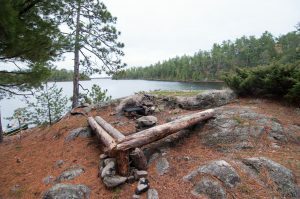 Another campsite right in the main corridor that numerous motorboats use on a daily basis to access the big part of the lake makes me wonder who it is for, timing and emergencies are the only things that come to mind. 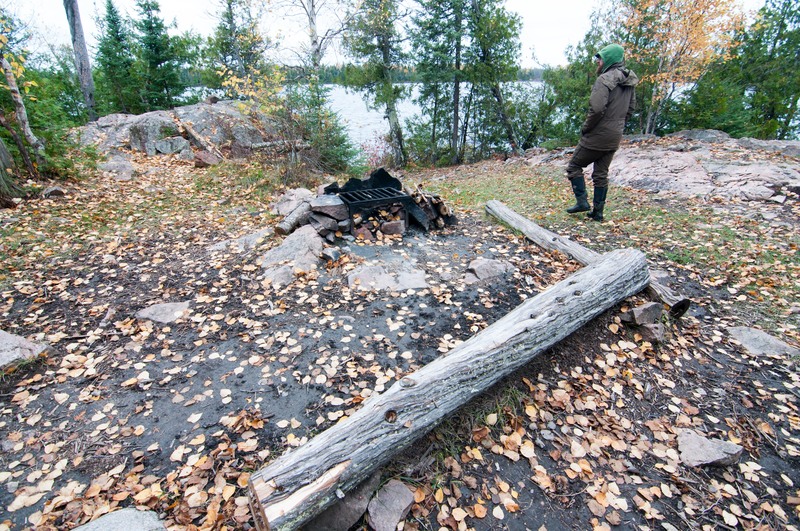 A tiny landing and exposed recently burned site make this an easy one to pass up. Outside of the fact that this is right at a pinch point in the main corridor that gets used by motorboats to get out to the main lake this is an above average site. 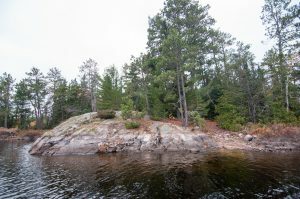 If it were anywhere else on the lake it would it would get higher marks. 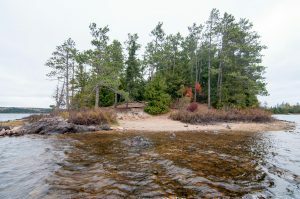 The south side of Clark Island is where you will find this larger than average site with beautiful sand beach landing. 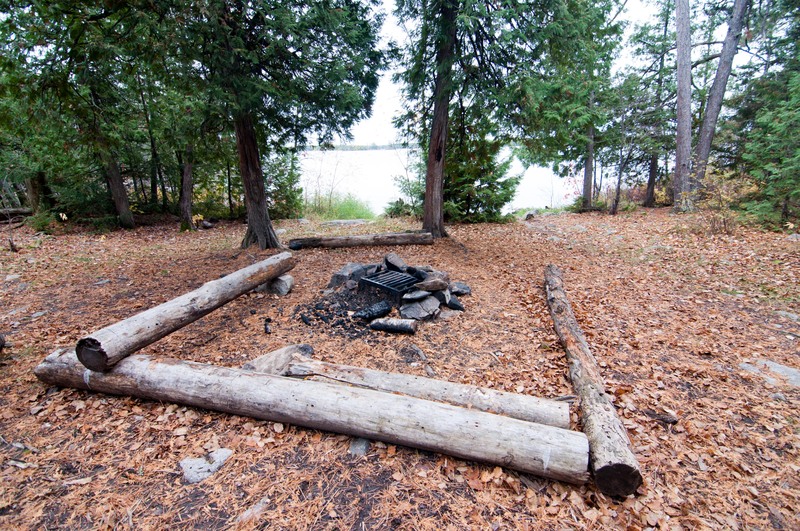 Its size would lead you to believe it has plenty of room for tents, but there are really only 2 spots to work with. 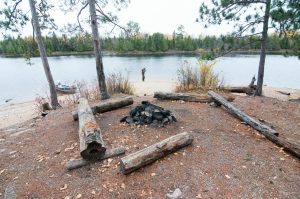 There are at least 4 spots for tents at this jumbo campsite. 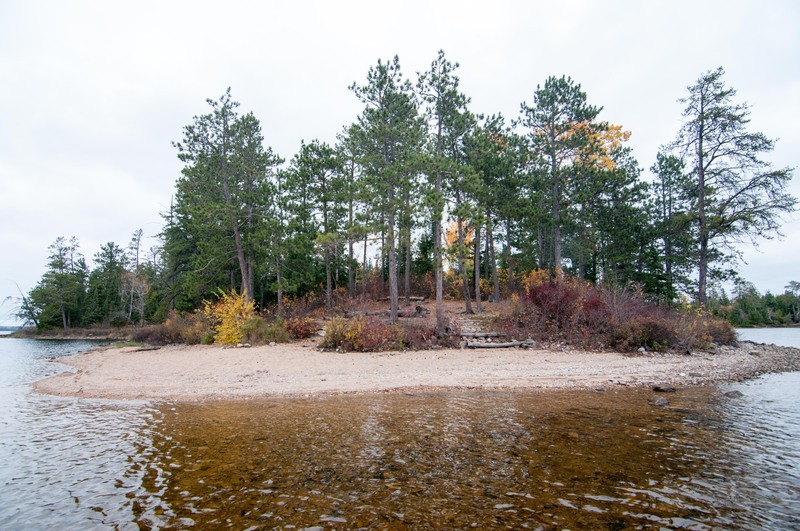 You can’t beat the sand beach landing and the large fire grate area is surrounded by level terrain. 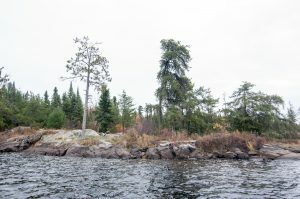 This site does everything really well but at the same time there is nothing all that remarkable about it either. James Bay: a place for true campsite connoisseurs… No seriously, there really isn’t anything back here. 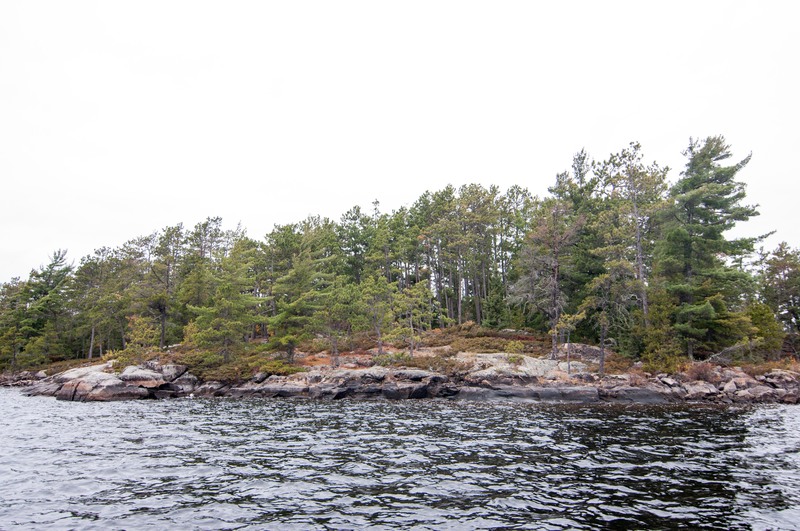 This is a lonely bay, mostly due to the fact that it has recently been affected by fire and feels a bit desolate. The site itself is quite alright actually, with a lofted fire grate area on top of a flat slab of rock and couple of decent tent pads, it just doesn’t feel homey. 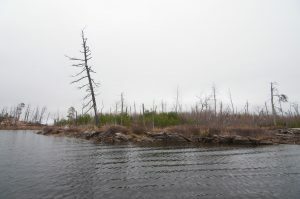 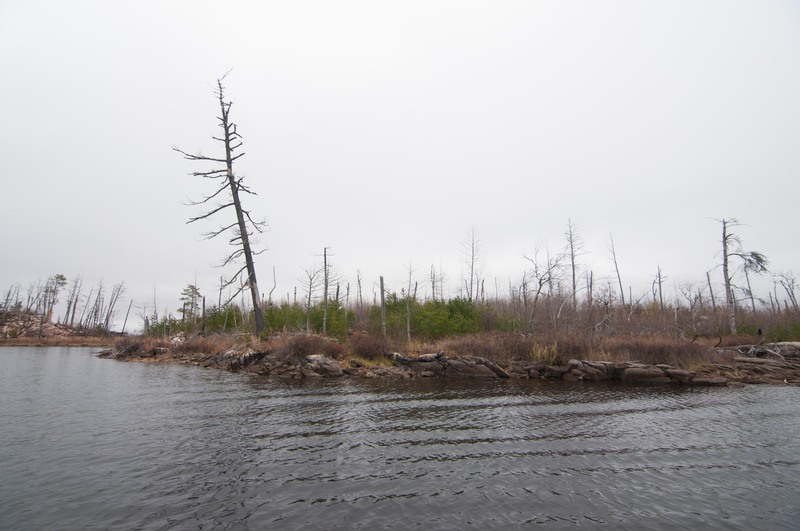 If you find it necessary to push on farther into the shallow weedy bay that is James Bay you will find one stunted lonely pine crookedly standing guard next to a seemingly defunct fire grate, almost like it’s the only thing it has left in this world. 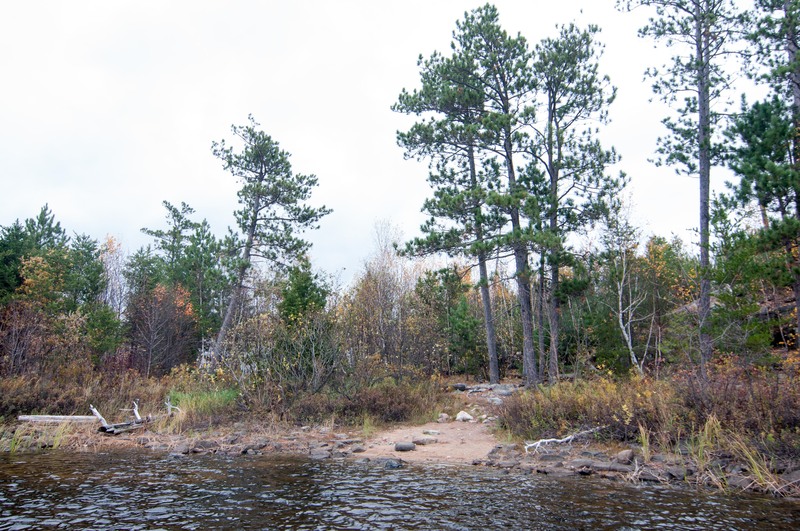 Of course we all know this will eventually become a Pixar movie when they run out of ideas. 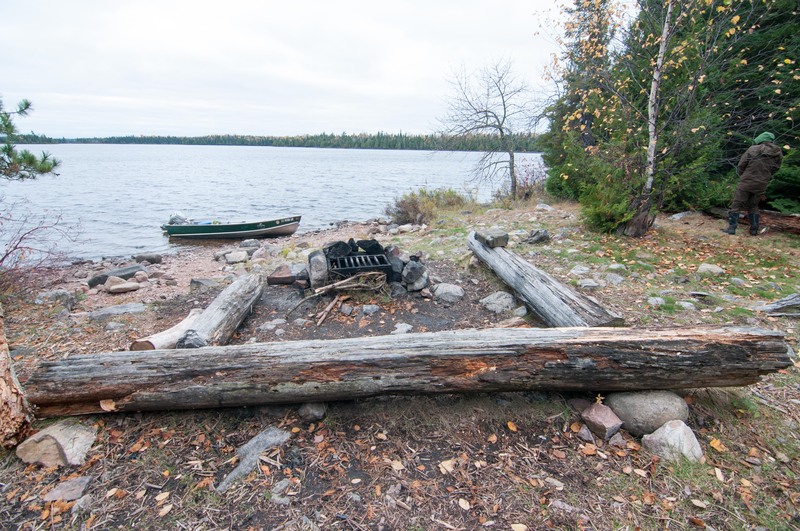 I’m not one that takes pleasure in disparaging poor BWCA campsites, but seriously though I do and this one is hilariously sad. 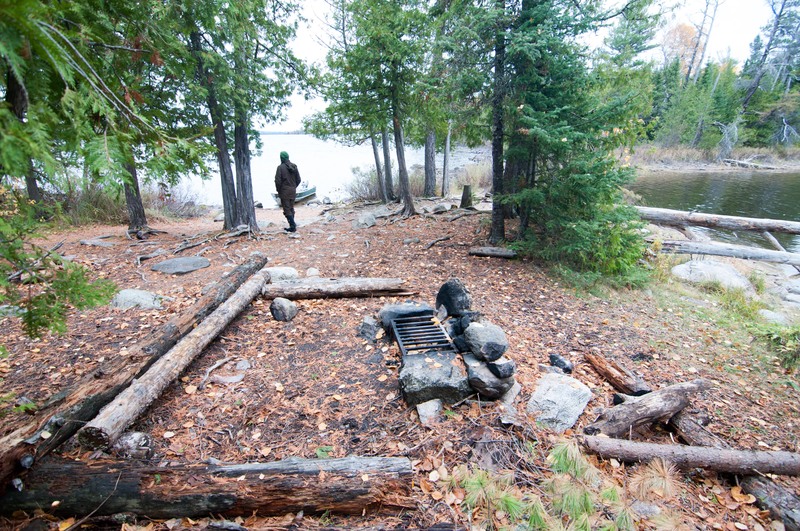 We didn’t step foot into the actual campsite but we all know what’s going on in there. Maybe it’s nicer in the summer? 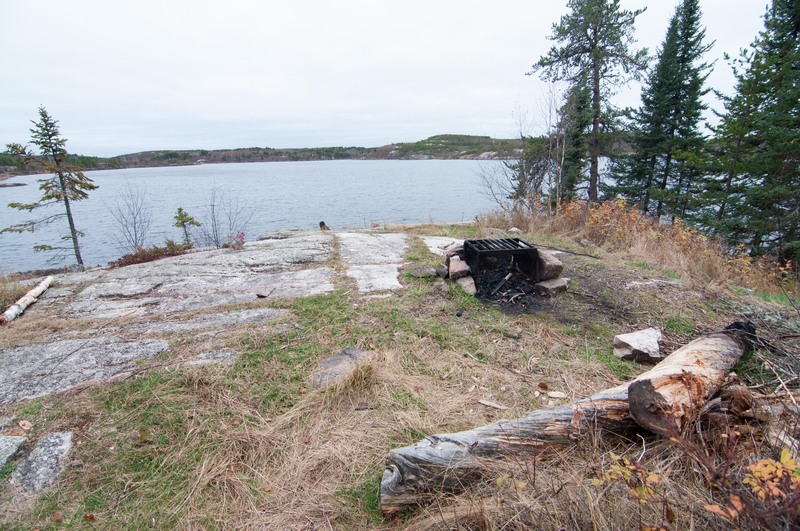 Alright, were back on track with this site on the southern tip of Campers island. 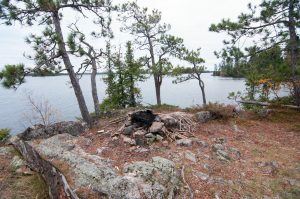 This was actually one of the first campsites I ever camped at growing up, and I remembered there being much more of a climb to the main camp where there were amazing views. Its not quite as dramatic as my memories but nevertheless it is an elevated site with nice views from the fire grate area, and two nice tent pads, one right behind the fire grate and one even higher up. 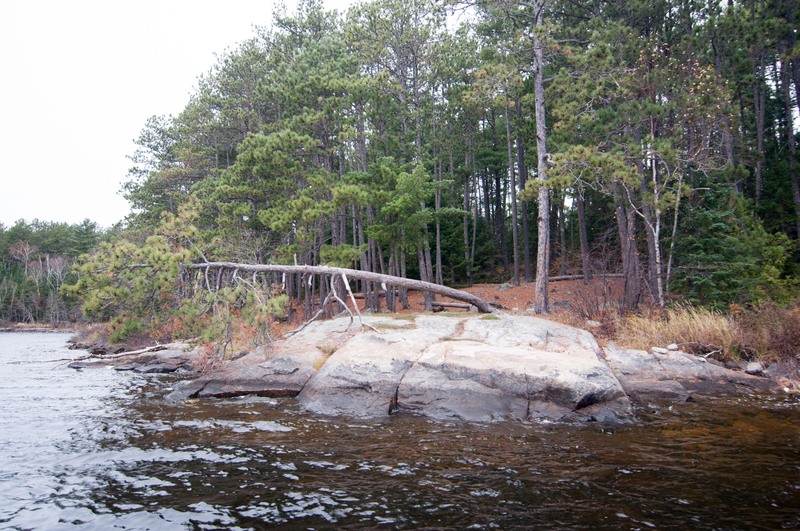 The landing here is the worst part. Everything about this site is at an angle, outside of the small level area around the fire grate, and it feels cramped. Considering it faces directly west it is a good thing this spot has nice tree cover, the landing is nothing to brag about but the site itself is nice and flat, has 3 solid tent pads and nicely laid out fire grate area. 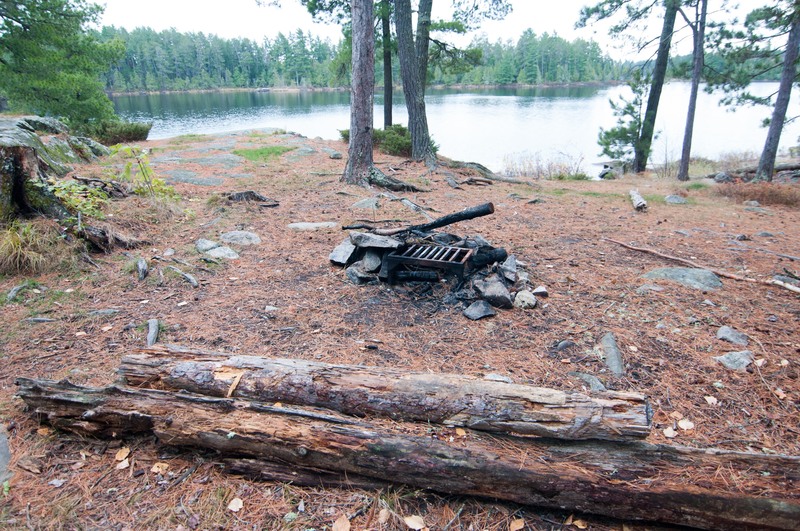 Have you ever wanted to cut a fresh campsite into a random spot in the forest before? Well this campsite is the next best thing to actually felling trees, because it feels like it’s a work in progress. 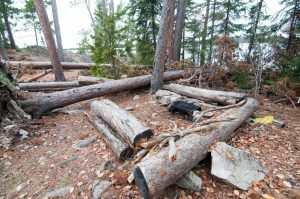 This is due to the fact that it was affected by some recent storms and has quite a few trees down in the site, even if the trees weren’t scattered about its in an odd spot, well away from the landing up in the woods. 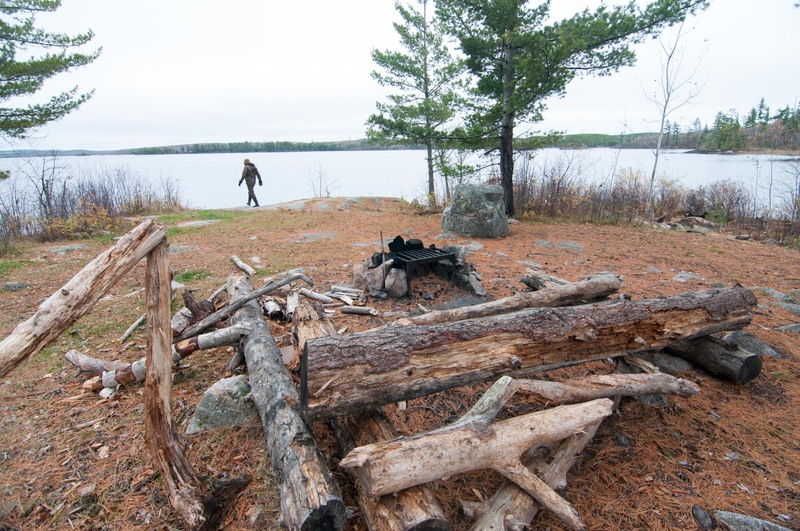 We weren’t even sure if we found a reliable place to throw a tent down. The uniqueness of this campsite doesn’t necessarily make it a better, but it does offer a very secluded option for smaller groups. 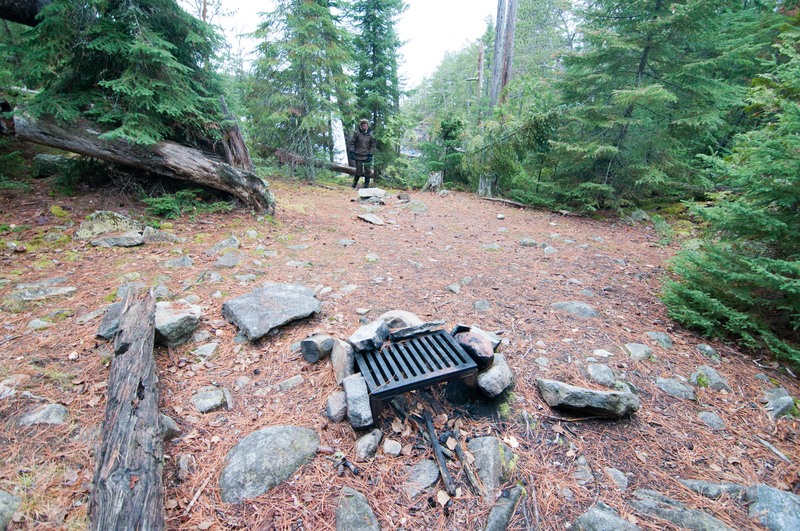 It has a tough landing and there is a bit of a walk to get back up into the actual fire grate and tent pad area. 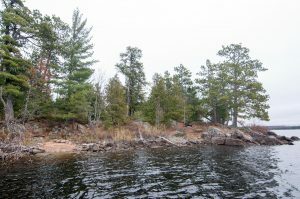 The feel in the site is more wild than most of the sites on the lake. 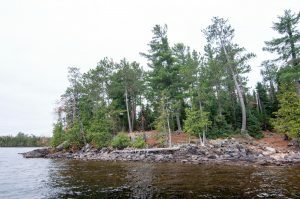 Another very unique campsite here on the western shores of Bradley Island, so much so that I have included 3 photos. The massive sloped rock canoe landing is a bit trick but it is worth the effort. 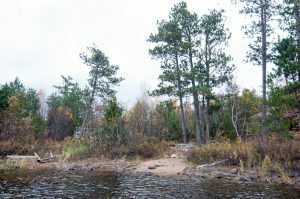 From the shores of Sag you take a bit of “hike” up into the woods where you will find a beautifully laid out campsite. 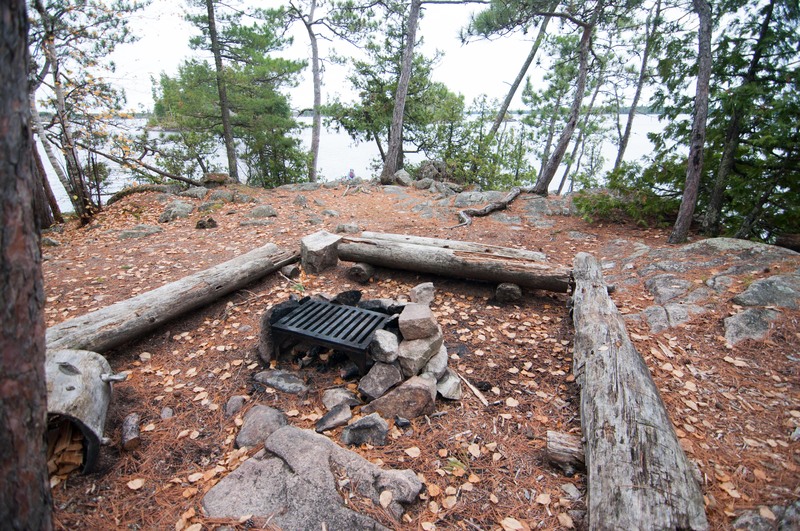 At least 4 tent pads surround an excellent fire grate area. 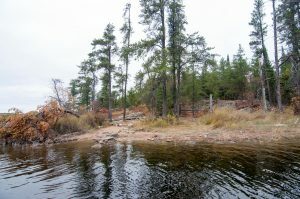 When the water is higher I am sure the landing is much nicer as it would reach the sandy beach on the shore. After hiking up from the private bay you will find a small seldom used site. 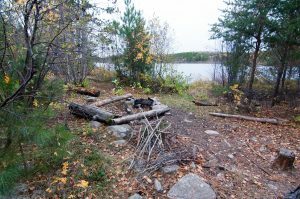 It only seemed to have one tent pad. 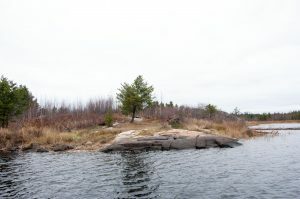 After a short climb from the water you will find a nice elevated campsite perched on top of a cliff. 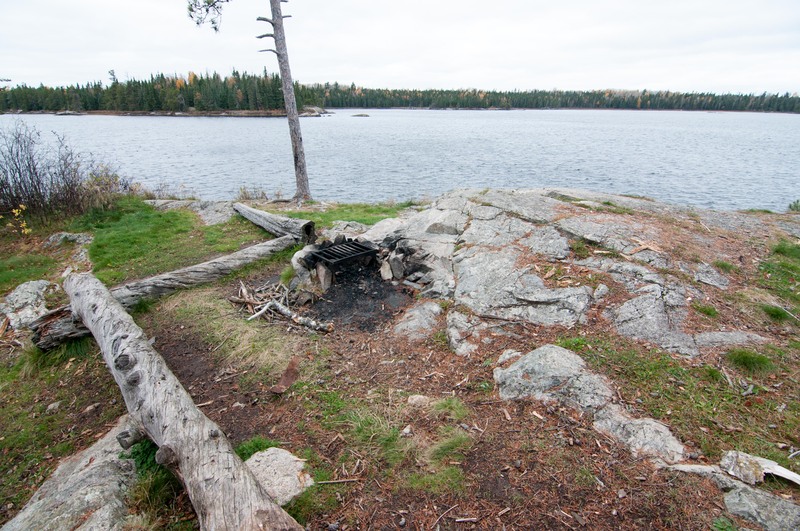 It seemed to get little use, which was surprising because it is a nice spot. 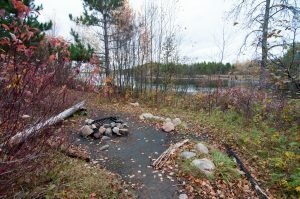 There is one large flat tent pad. This is a sprawling site with 2 large tent pads, nice airy fire grate area and decent canoe landing. This was our home during the process of visiting the campsites on Saganaga and ironically we failed to take any pictures of it during our three-day stay so you’ll have to trust me when I say it’s a winner. 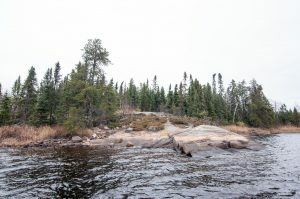 The landing was no fun to deal with but after a brief climb into the campsite we were rewarded with a multi-tiered gem. It looks out over big water to west, but is still relatively protected from winds. 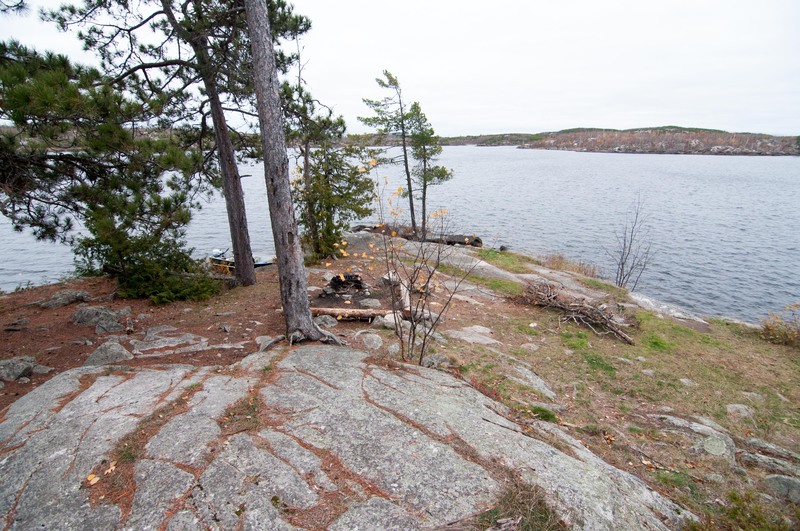 Unfortunately, the view from most of this campsite looks into Canada and a number of private cabins. This may not be the best option if you are looking for a true wilderness experience. You could excuse this downside if the campsite was nice, but it’s a real scrapper that should only serve as a port in a storm. 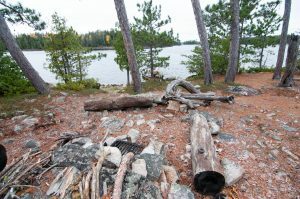 This is a text book BWCA campsite. 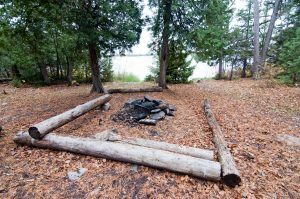 With 4 nice, large, and spread out tent pads surrounding a level fire grate area it makes perfect sense for groups of 8 or 9. Its views over the expanse of Saganaga Lake to the south is just a cherry on top. 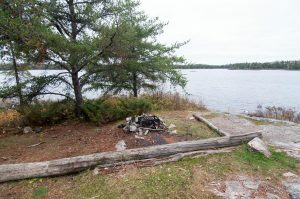 The proximity of this campsite to the motorboat corridor people use to access Canada paired with its lack luster amenities make this an easy campsite to pass up. 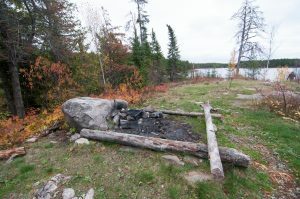 If your looking to get spooked this campsite is for you. 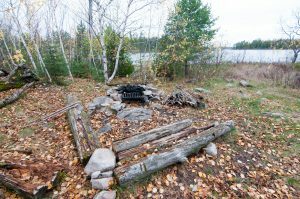 The foundations of multiple old buildings can be found throughout this site so you know its haunted. 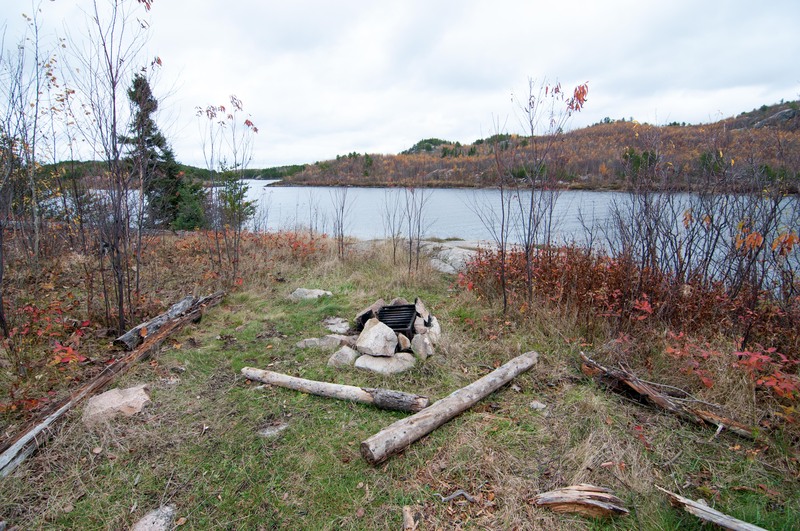 This was one of the most difficult campsites to find, and it clearly does not get used. 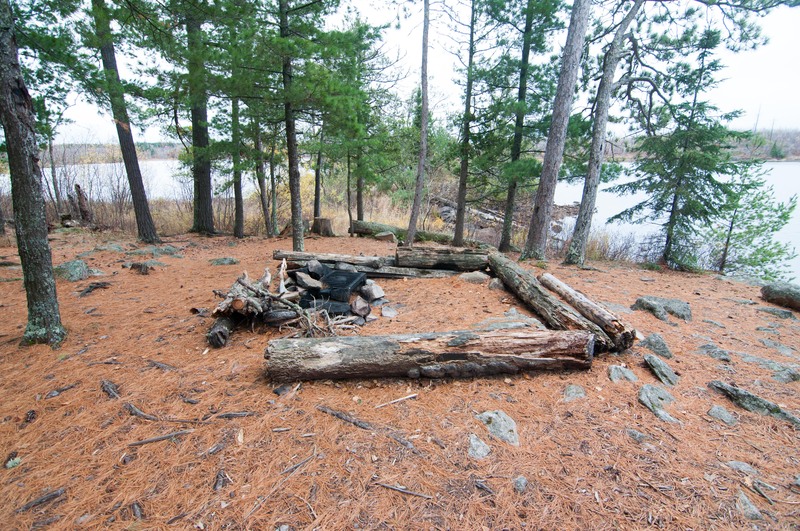 If you want to call the old foundations tent pads, then there is one good one. Next week on “Ghost Hunters” : Terror on Saganaga! 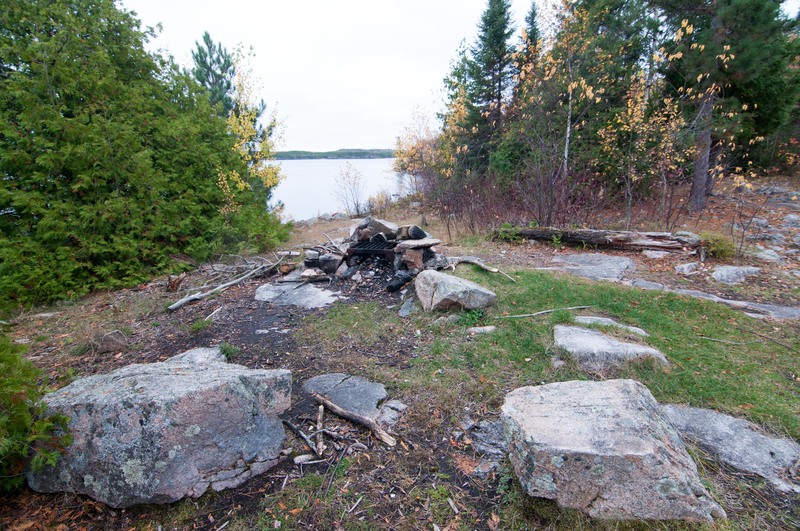 Just to the north of the haunted campsite (disregard the distant shrieks in the night) is a quaint private site that would be perfect for 2 to 4 people. It has one nice tent pad and very cozy fire grate area. If you look hard enough you can see some cabins across the lake, but they are easy to miss otherwise. 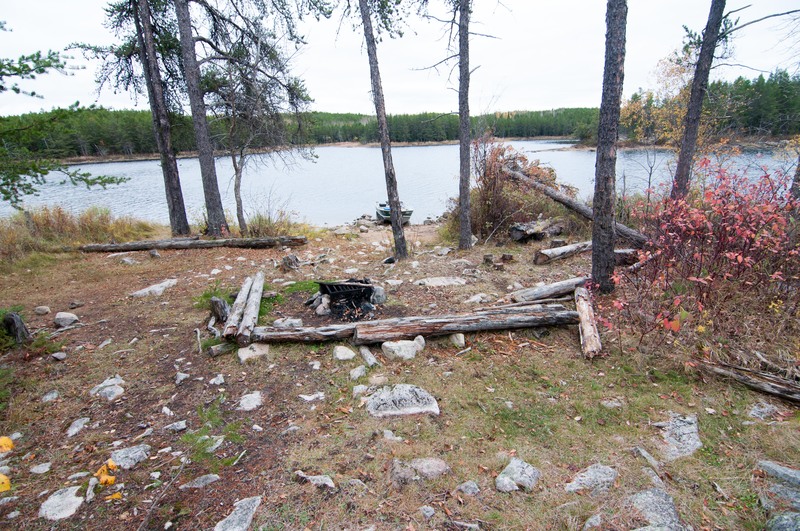 Holy bananas this is a derelict campsite and I am assuming it is because of the moon scape surrounding it caused by wildfires. 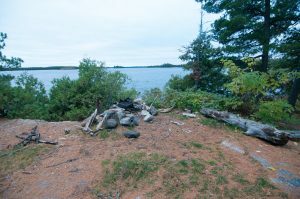 The only thing this spot is good for is a laugh; I’d rather take my chances at the spooky site across the bay. 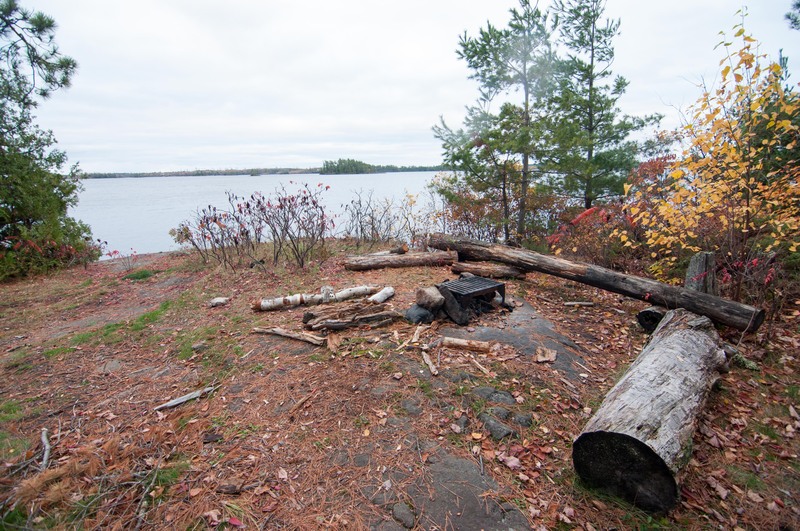 In the same back bay as the previous site this campsite is workable, nothing flashy but it will get the job done. 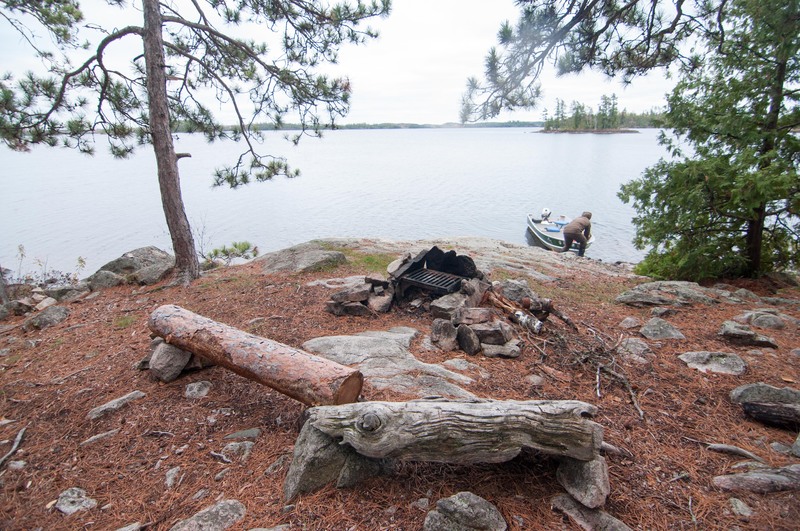 On a little island all by itself is where this nice campsite calls home. 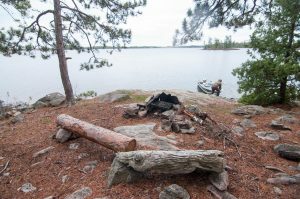 A very rocky landing is the only hardship this site will throw at you, the 3 tent pads and wonderful fire grate with a view will make up for any struggle the landing gives you. 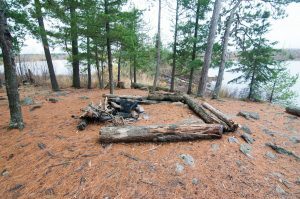 On the southwestern tip of Connors Island there sits a campsite that is well past its glory days. Fire and lack of use have allowed the wilderness to creep back in and start to regain control of the land at site. 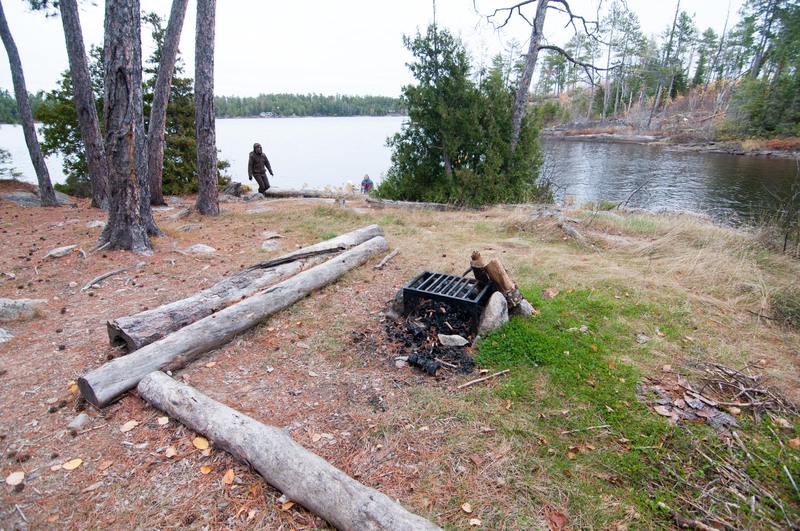 A single tent pad and a Spartan fire grate is what you will find if you venture past the landing. Yet another campsite that I camped at in my youth that is vastly different from what I remember. 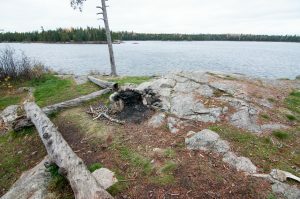 In the case of this spot it is vastly different due to the Ham Lake fire in 2007. It is a nice campsite if you don’t mind the area being a little barren. A great landing and plenty of level ground for sleeping and moving about makes up for the scars. A sandy landing leads up to a secluded fire grate area and two huge tent pads at this above average campsite. 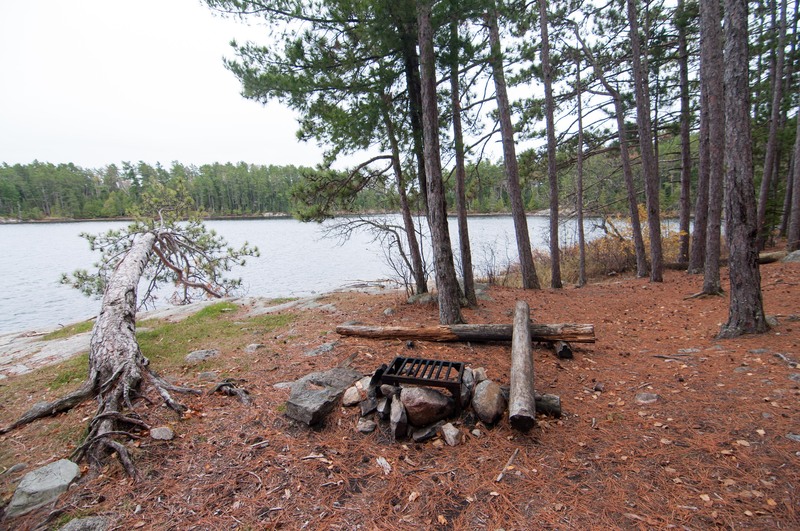 Another slightly better than average campsite can be found across from #61 on a small island. 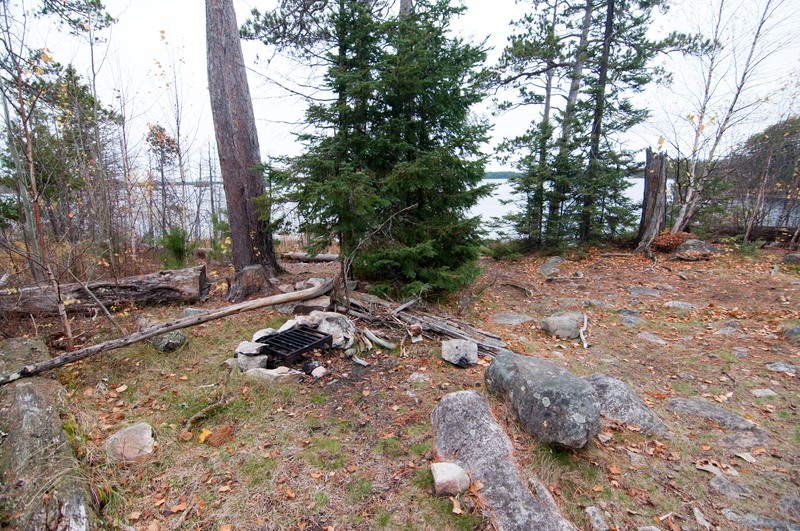 Its proximity to some of the best fishing on the lake make this a great base camping option. 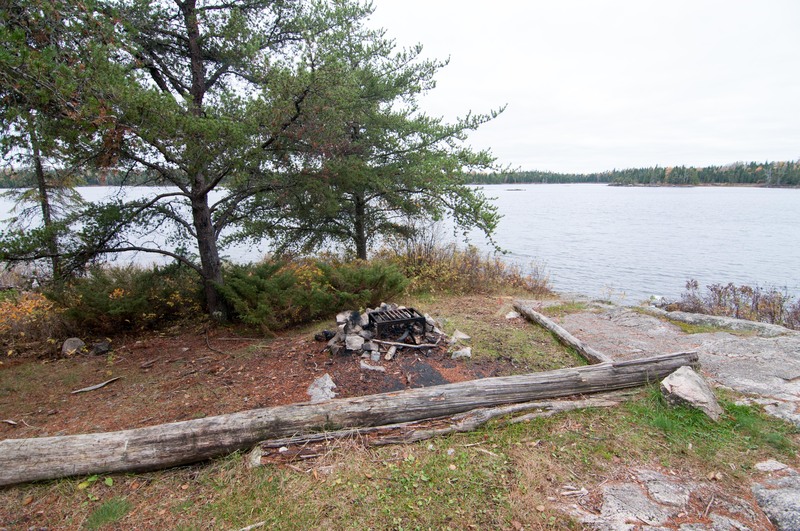 A wide open campsite with big views into Canada is what you will find on the southern tip of this tiny island. 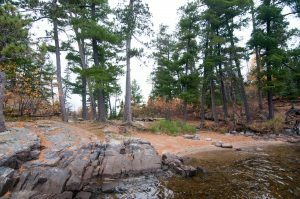 Just around the corner from this spot is Saganaga Falls which can be a fun spot in the summer and great fishing in the spring. 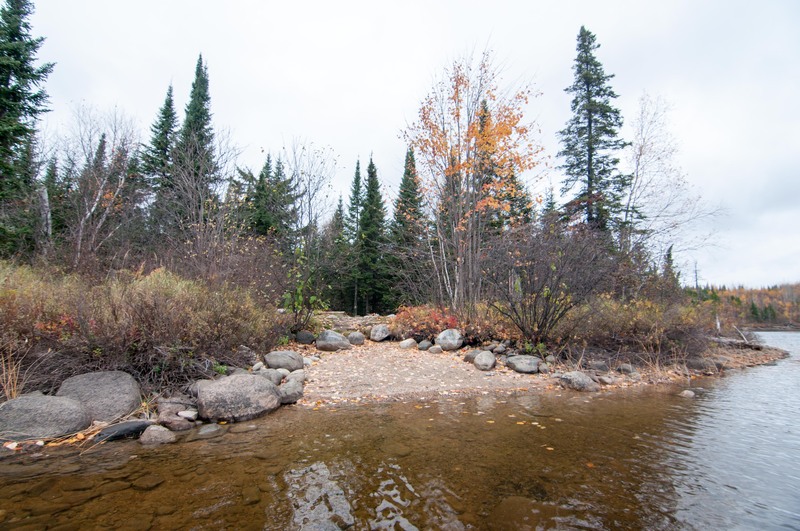 Keep in mind there are restrictions on fishing below the falls early in the season. Woah nelly we saved the worst for last. 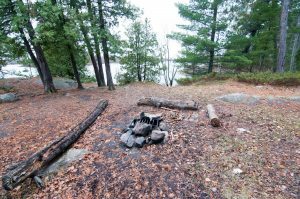 It may actually be detrimental to your health to camp here. I feel bad for all of the other campsites out there for even using the word campsite to describe this place. 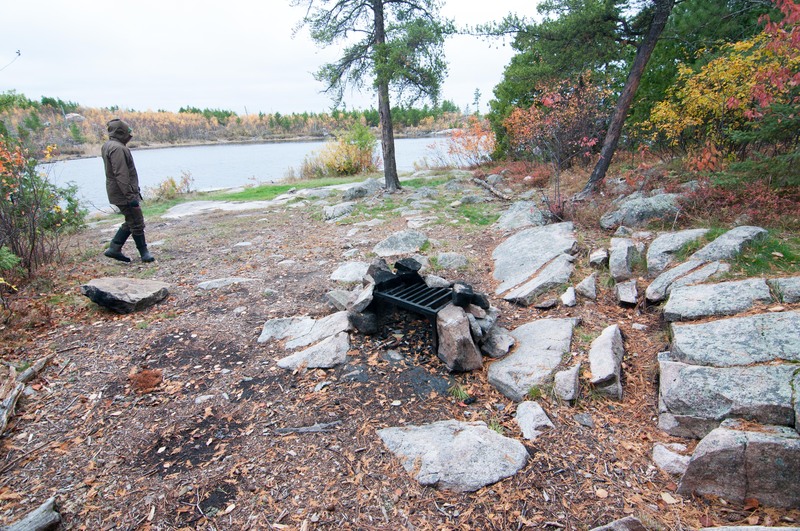 This is not a campsite, it’s a random piece of land that happens to have a fire grate on it (we did not search for the latrine). 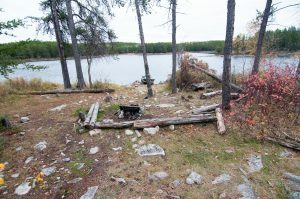 As if its location in a shallow mucky bay wasn’t bad enough this sad, this neglected puppy of a “site” offers nothing in the way of amenities. 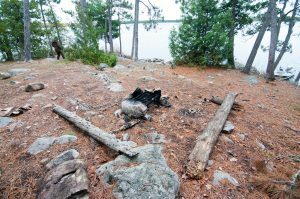 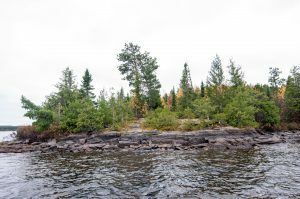 We started with arguably the best campsite on the lake and are ending with unequivocally the worst, possibly in all the BWCA. 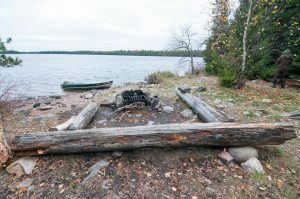 Any site with an asterisk next to it is missing in action. 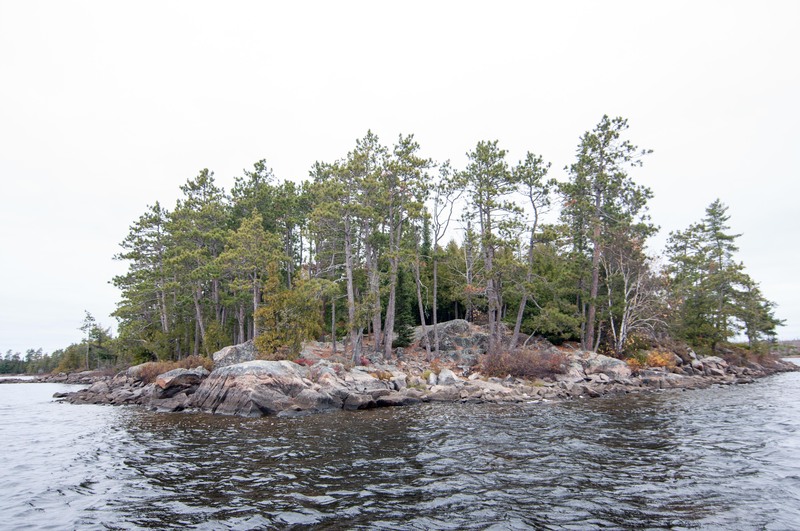 We were unable to locate these spots, which means they may not be worth spending much time searching them out. 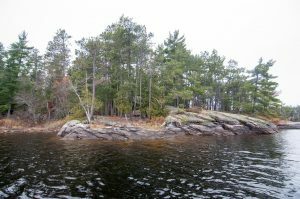 If you do find any of these sites let us know what you think.